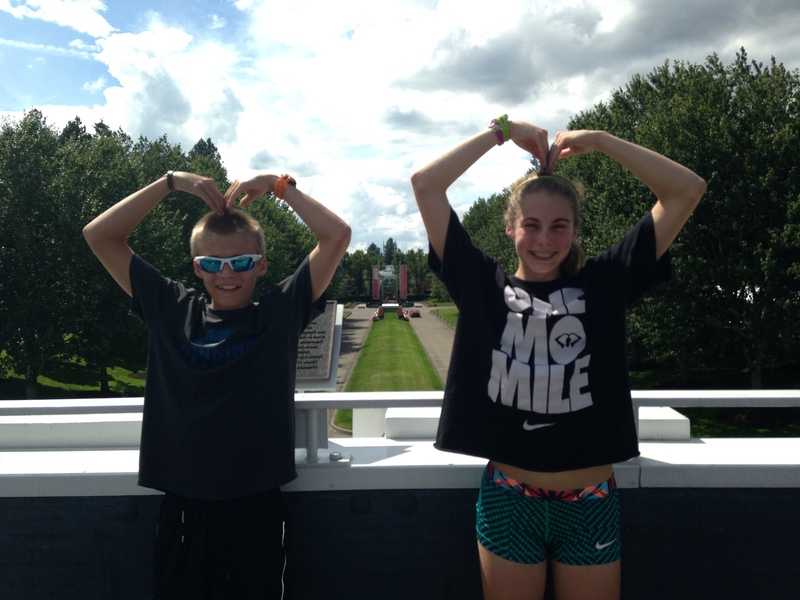 Day 29: Driving, Diners and A Famous Triathlete? 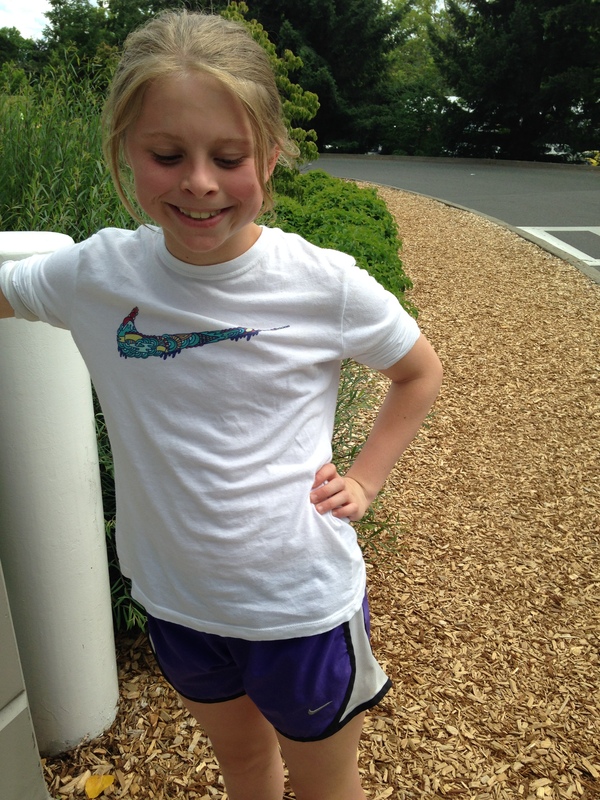 Eliz Howard on On our way…..finally! After sleeping in the worst hotel by far this trip in Hayward, name shall remain anonymous, we got up for an early breakfast before heading over to Pleasanton for the morning. I wish I could say it was because we were jaded from our experience the night before, but that would not be accurate. From a dirty room, to management that was unable to replace a light bulb, to the guest smoking inside the hotel, it was overall a less than acceptable experience. But one out of seventeen days is not bad and at least we had a bed to sleep in and place to do laundry which is far more than a lot of people, so for that I was grateful. As we rely on ratings and comments from previous customers, Scott has already forwarded his comments to hotels.com to help accurately inform future guests. The weather was absolutely spectacular for the California State Championships. When I signed them up, it was more due to schedule and where we would be at that period of time in the trip, than anything else. Sure they would accumulate points for rankings but we can be done at most sprints available across the country. 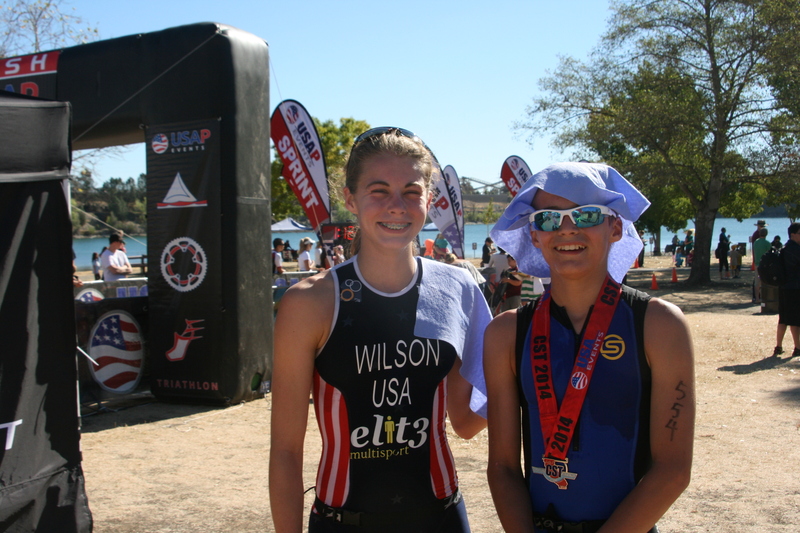 The other three races that the kids either have competed in or would compete are specific to Nationals and the athletes they would racing in Des Moines or in Westchester, Ohio laterr this summer. 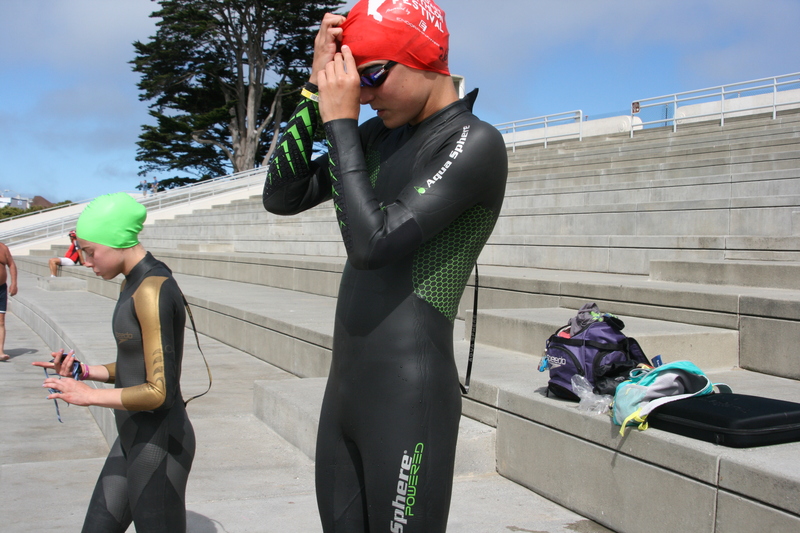 The added benefit for this race however, was that it allowed them the opportunity to gain more practice in a wetsuit and for Kenzi to compete in a distance that she will exclusively do next year when she ages up. 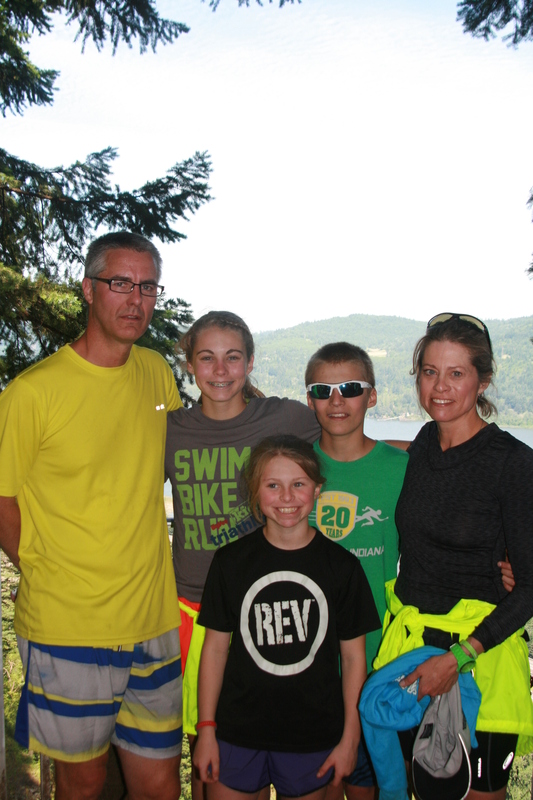 The kids were not nervous and really did not know what to expect with this race as this would be the longest open water swim in a tri race that either of them have completed which included a half mile open water swim, an 11 mile bike and a 3.1 run. 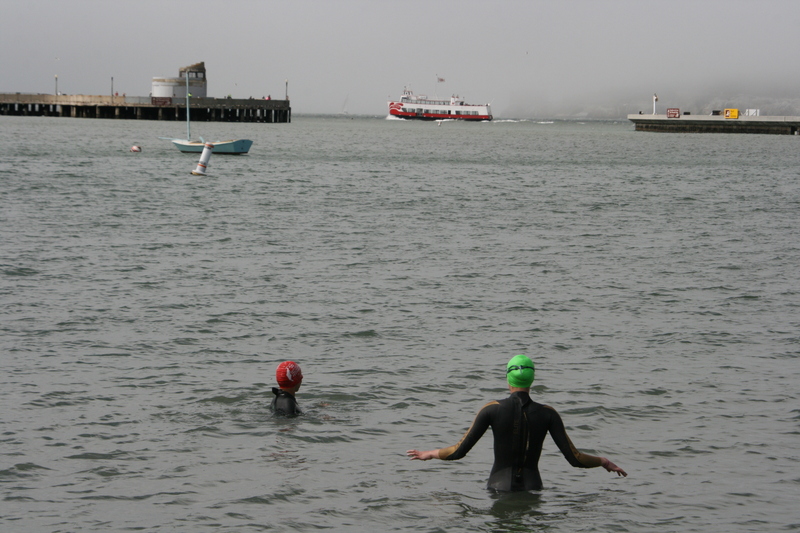 They thought the water felt warm enough to swim without the protective neoprene skin, but anything has got to be warmer than swimming in the ocean in San Francisco! But rule of thumb is, if most people are wearing wetsuits, then you wear one too as it provides a layer of buoyancy and keeps you competitive with the rest of the field. Today’s race also provided another new experience for the kids. Athletes would start in three different waves of 100 people in what is referred to as an in water or deep water start. Each race director has different set ups and even though there was a beach and the way we thought the race would start, apparently it is considered less shock on the body when wearing a wetsuit if you start in water. We are always learning. Apparently the water start was an experience. From the large catfish near the shore, apparently the size of a small child, to most of the swimmers not knowing the route of the swim, it was a little daunting. Kenzi was trying to answer questions (as if she knew) when the horn started. Not even having her googles on, they were off. Needless to say, the kids are starting to understand pack swimming or at least gaining more confidence, made their way to the front. 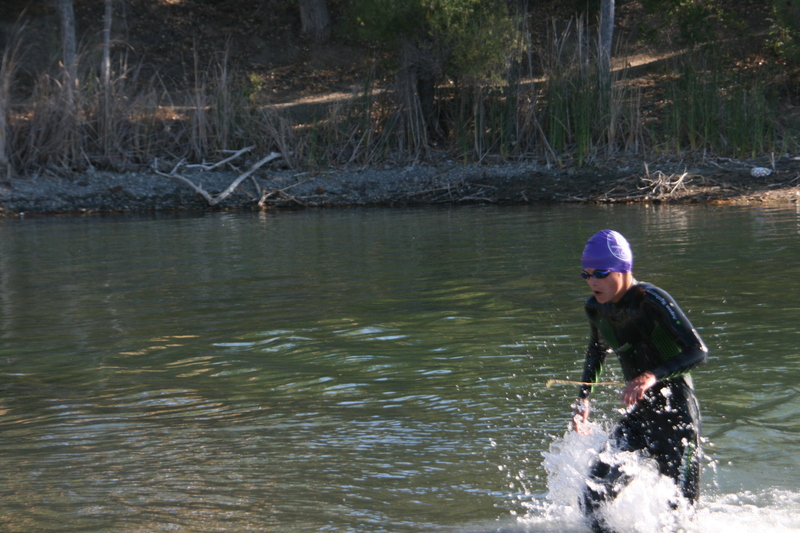 Zach was second out of the water with a fairly large gap (30+ seconds) before the third swimmer. Kenzi was fifth or sixth out about 2 minutes behind her brother. They looked really strong! They finally seem to be getting comfortable in their wetsuits-goal accomplished. 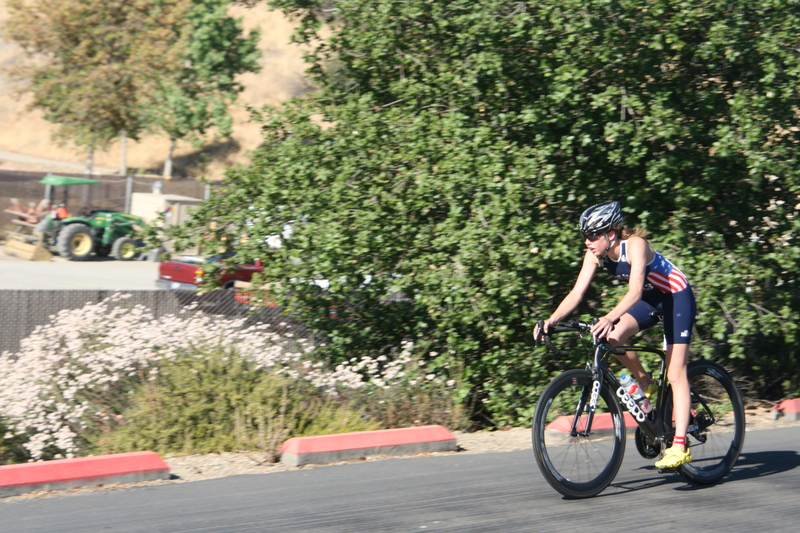 I love this sport and I love that my kids are incredibly passionate and committed to seeing where they can go, but I am not sure I will ever get comfortable with the bike portion and today was no different. Once they transition, they are gone for the next 30 minutes (give or take) and at lightening speeds. There may be switchback turns, hills, and testosterone filled riders with full disc wheels irritated that youth are beating them, etc. The reasons are numerous and it is always heart wrenching, but today I was particularly on high alert. Sure there are volunteers helping to guide traffic, but more races than not, there is always some driver who disregards the cones or is emphatic that have to through, less concerned about racers and more concerned about their own agendas. Today was particularly unusual as a young Hispanic couple had chosen the park for their wedding ceremony about the same time as the triathlon. For those reading this, please pray that these feeling subside and that I can rest knowing confidently that God is with them. I know this in my head, but my body symptomatically does not respond with the same assurance. Of course, my worries were completely justified. Both Zach and Kenzi diverted several cars each, as volunteers allowed them to enter the single lane road to attend the wedding. Bad planning, but people watch out! Cars and cyclists don’t mix and allowing cars to cross the line of a race was absolutely absurd. Scott and I were screaming to stop traffic and were strongly encouraging volunteers to HOLD cars. They knew they were totally in the wrong and felt terrible, but seriously use common sense. I guess there was a reason for me to be worried. Both finished the race strong. 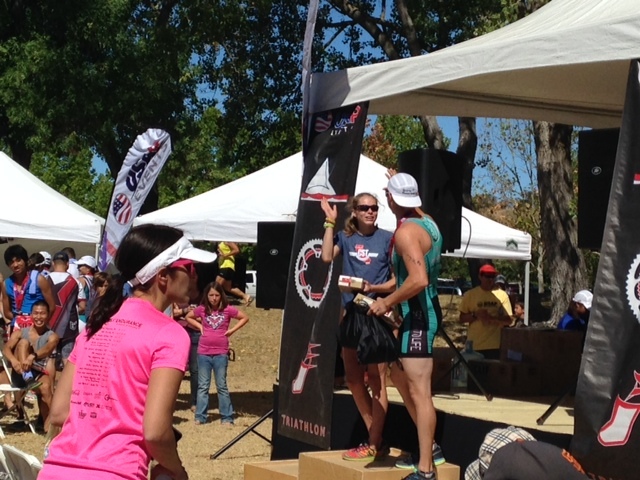 Kenzi finished as the number one woman not only in her age group but overall. She actually was a bit surprised at the results as she did not feel she had given it her all. 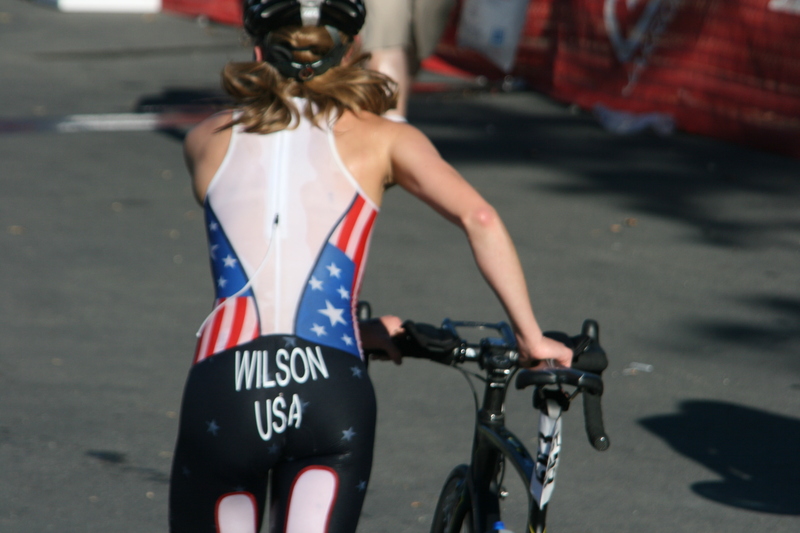 Never satisfied, she was already wondering where her times would be with the elite racers next year. Seriously child, enjoy the win. You did great and gained more experience. 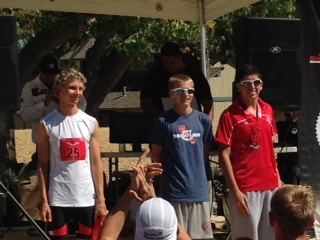 Zach did equally as well as he finished first in his age group (15-19), they waivered him in at an ITU member as a 13year old and seventh overall for the day. Great, more stuff to carry home. In fact, Scott and I have decided to put a UPS box together at the next town to send home as we have numerous things we don’t need and have more of a chance to get lost or broken. After the race, we headed back to the hotel to load up and then we stopped across the street for an authentic Mexican lunch at a taqueria. Oh my goodness! Though I stuck to my old standby, asada (steak), they had options for braised tongue and other parts. I did indulge in the roasted chili’s and washed the extremely hot peppers down with a refreshing fresh fruit cantaloupe concoction. Yum! The drink was so good that after one large sip, Kenzi ordered one too. Once finished, we were back on the road headed to Carmel and then to Big Sur. 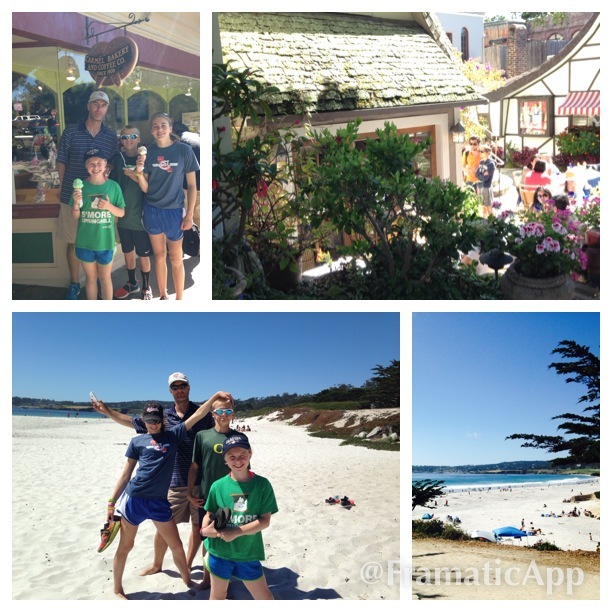 Carmel was as every bit as lovely as they say. The homes were as unique and charming as a Thomas Kinkade painting with colored flowers, moss laden roofs and cobble stone walkways all nestled across from the famous Pebble Beach golf course. We played on the beach and enjoyed the cool breeze as our bodies melted into the warm sand, and we took a few moments to stretch our legs. We enjoyed walking through the small town and perusing the shops and private passageways that lead to secret gardens. Carmel was recently voted one of the most romantic cities in the world and there was no doubt in my mind as to why. We ate ice cream and I enjoyed an espresso and cinnamon crisp. Okay, another place Scott and I will have to come back and visit without kids. As we exited Carmel, we saw a “wild boar” crossing sign which seemed rather odd considering such a magical experience and all began to chuckle as even the kids realized Carmel was a very upscale fancy community. 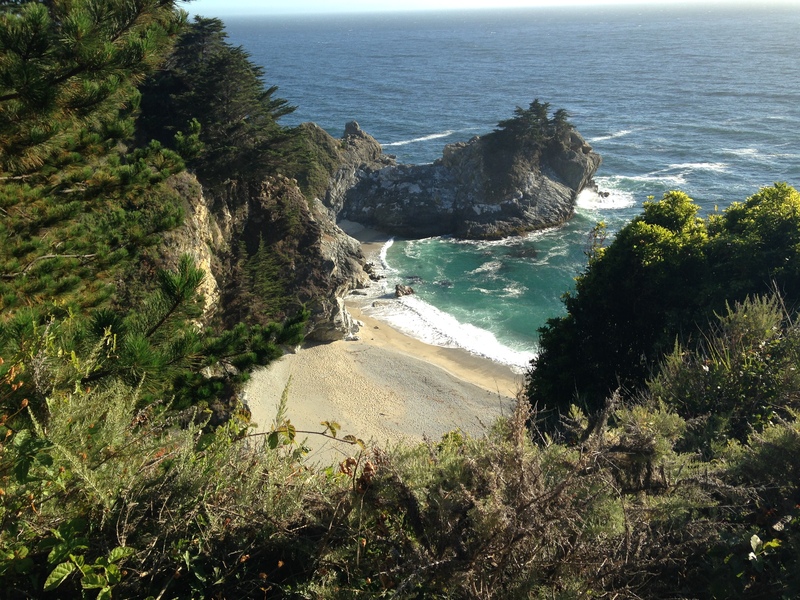 We headed along the coast and again experienced the beauty twists and turns of the California highway. This time it was sunny and I could enjoy the cliff drops at their full splendor. 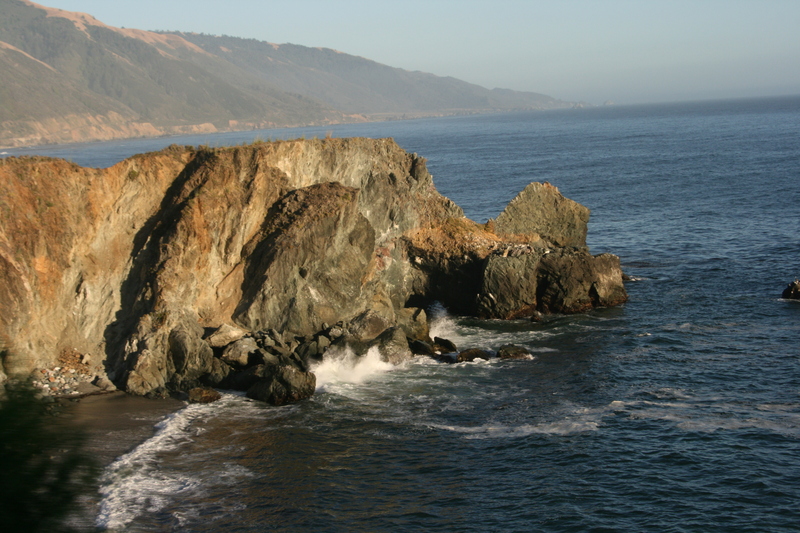 It was very beautiful and thrilling and we continued to make our way to Big Sur, stopping for only the most spectacular of views. 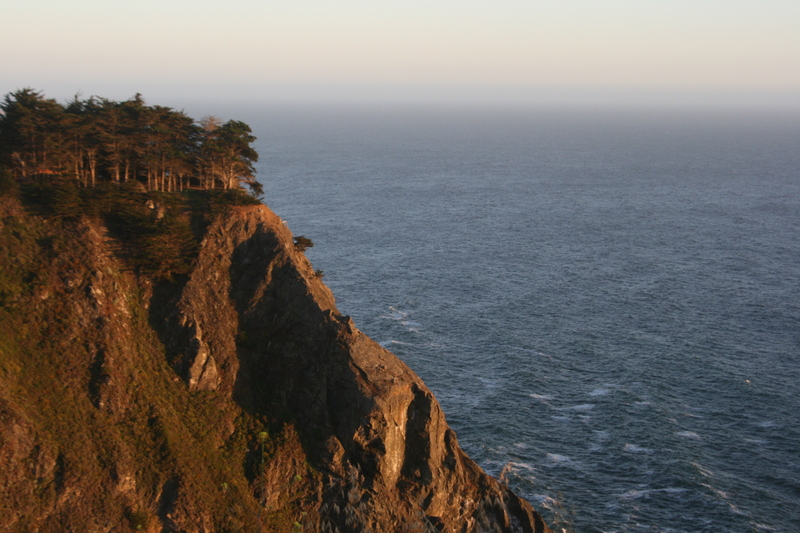 Probably our favorite stop was at Julia Pfeiffer Burns State Park, where the history and the beauty were unparalleled. We arrived late afternoon as the sun was shining its last rays against the waterfall and beach below. Each experience is more beautiful than the next and it is why I have chosen to document this journey as not to forget all that we have seen and done from the minute to the magnificent. After stopping for about 45 minutes, we decided that if we did not want to drive HWY 1 aka the Cabrillo Hwy at night, we needed to get back on the road and head towards San Simeon the home of the Hearst Castle, our next stop in the morning. But with this ever evolving trip, we had a slight change of plans. 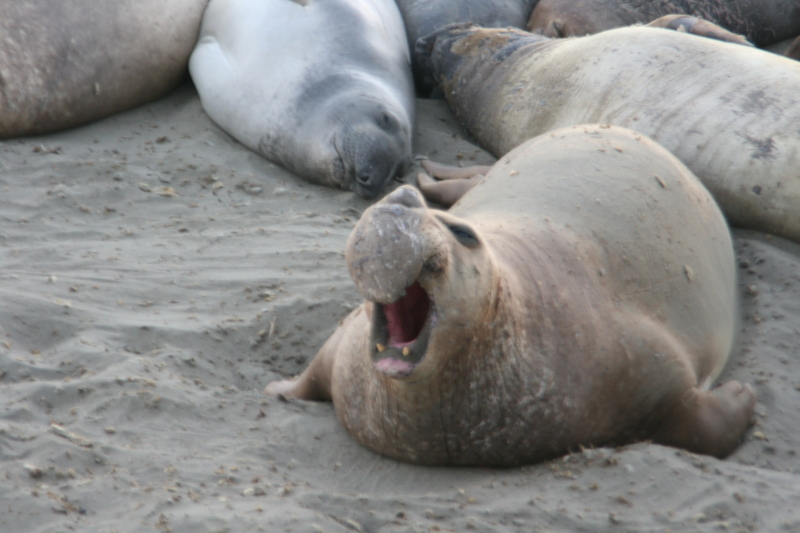 As we rounded the bend just before the sunset, elephant seals were spotted. Lots and lots of the ugly-nosed, barking blobs of mush. 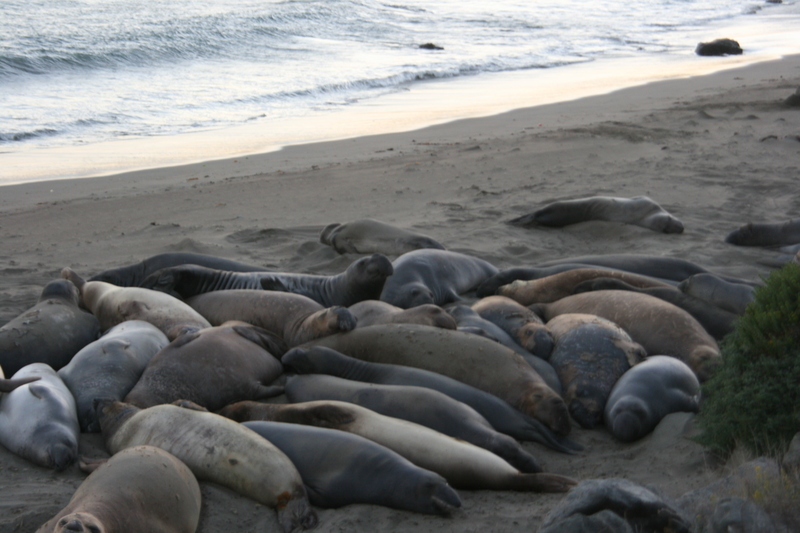 So of course, we had to stop by the Piedras Blancas Elephant Seal Rookery where there were hundreds of the seals snuggling in for the night, some which appeared to be vying aggressively for a desired spot. When we exited the car, we were rudely greeted by a harsh cold wind that had gone unnoticed during our travels and quickly snapped the last few photos before calling it a night. After dinner in Cambria, we all decided to keep driving and forego Hearst Castle in the morning. There were so many things yet to see and do and based on how they priced tickets to the various areas of the castle, we opted to save money and take in other sights. We will see what tomorrow brings. It was hard to get out of bed this morning. Sleeping in Napa was wonderful as even the linens were divine. Though the room was small, I felt like a queen. The bathroom was amazing with frosted glass and two plush robes and the two queen beds were draped in burgundy and gold. Even the complimentary bottle of Meritage was delicious. I would definitely plan to come back without kids and enjoy more wine, a more grown up meal and some alone time with Scott. I will give the kids props as they were absolutely on their best behavior, but it’s hard to fully enjoy Napa with kids in tow. With our healthy breakfast of oatmeal from our camping stash which we have not yet used, we headed to San Francisco for the day. 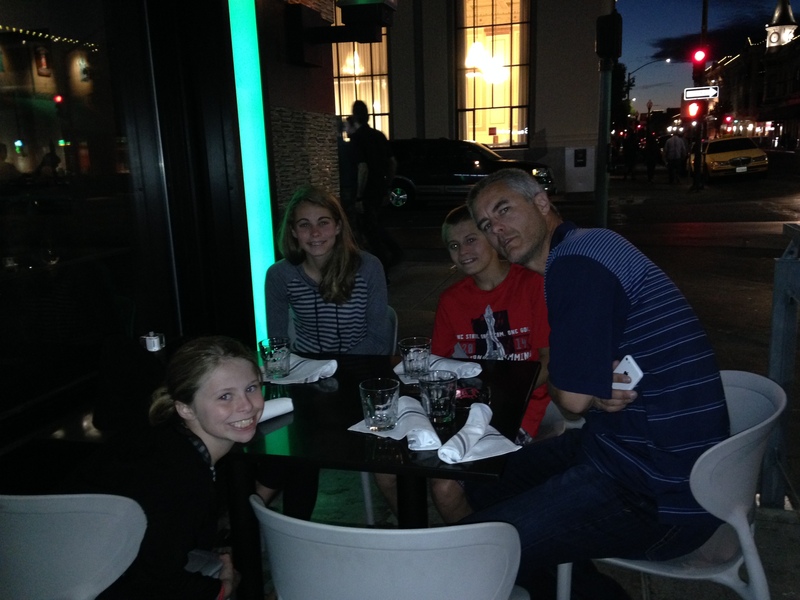 The kids have definitely learned the trade-offs….nice hotel, no fancy breakfast. 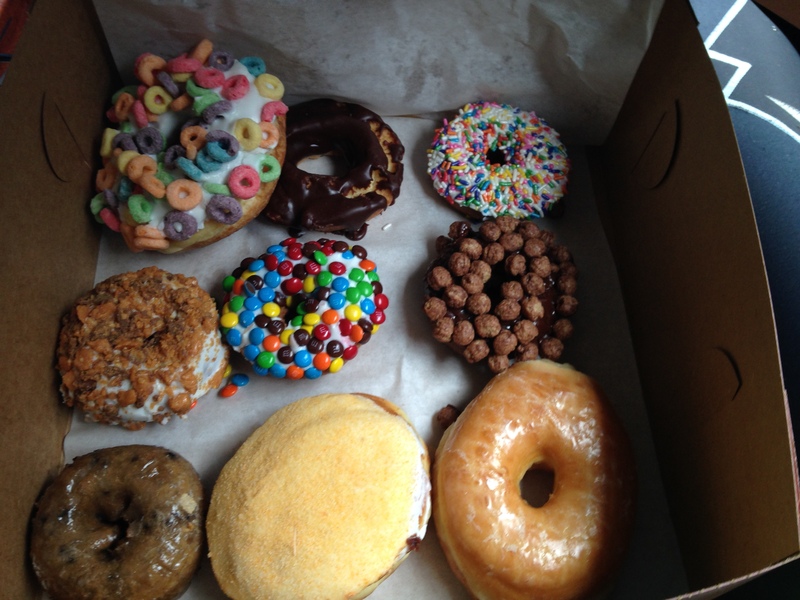 Sleep in the car, yummy breakfast. They seem to be pleased with both options and though we had not planned it that way, the appreciation on both sides of good sleep and good food are keeping us on budget and happy kids. 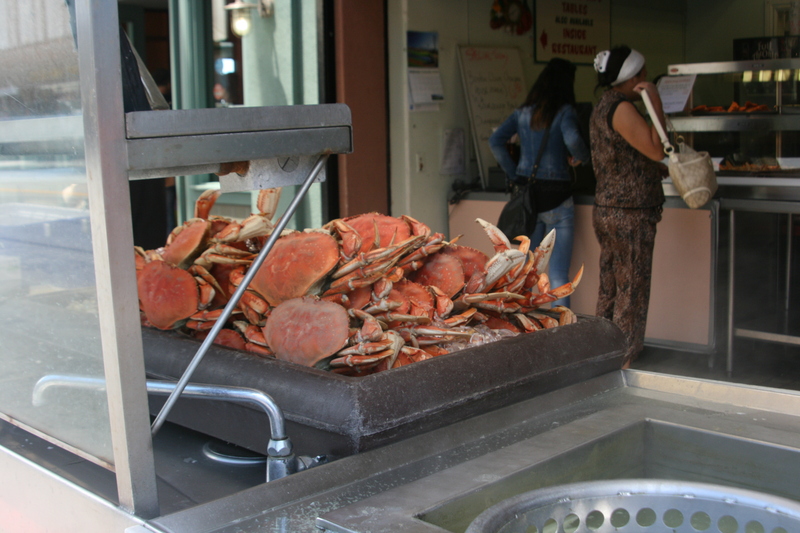 As we will be spending the day in San Francisco, I am sure there will be plenty of opportunities for a delicious lunch seaside. 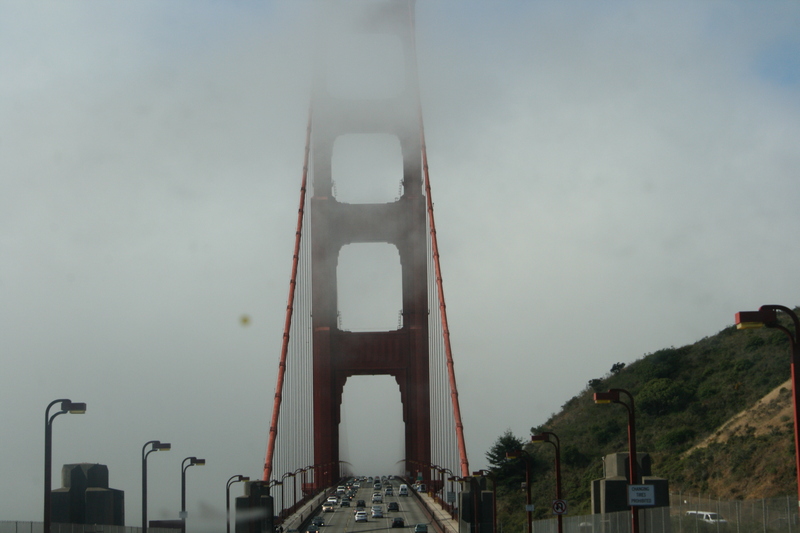 As we rolled over the famous Golden Gate Bridge, we were met with infamous fog which the kids thought was super cool. Add the seagulls calling to one another and the fog horn in the background alerting those on and off the bridge to be careful, we had yet another totally different experience of landscape and scenery and we were looking forward to our time in the city. As luck would have it, we immediately found a park to literally park our car in all day at no charge. 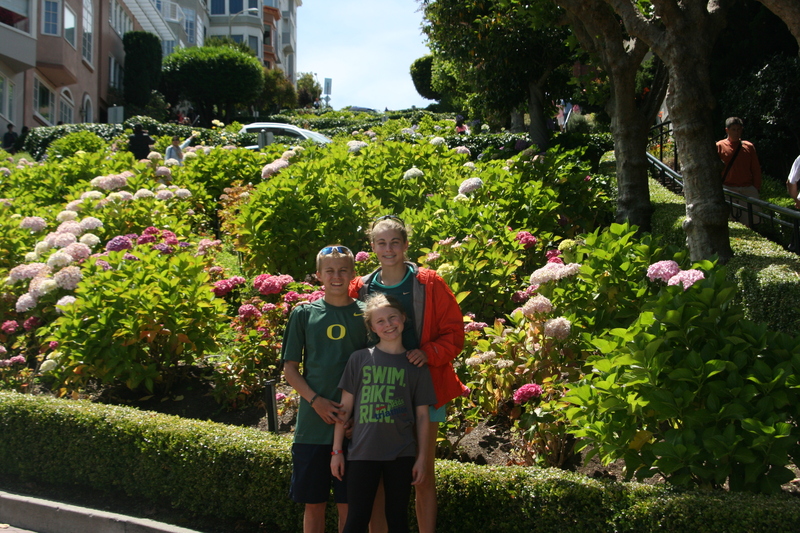 As Scott and I planned our day, the kids went on morning run along the bay and wouldn’t you know it, they ran into a fellow Carmel runner (Ben Anderson) whose family has been travelling through California. As with so many of these places we are visiting, there is always so much to see and do and narrowing it down can be a challenge. 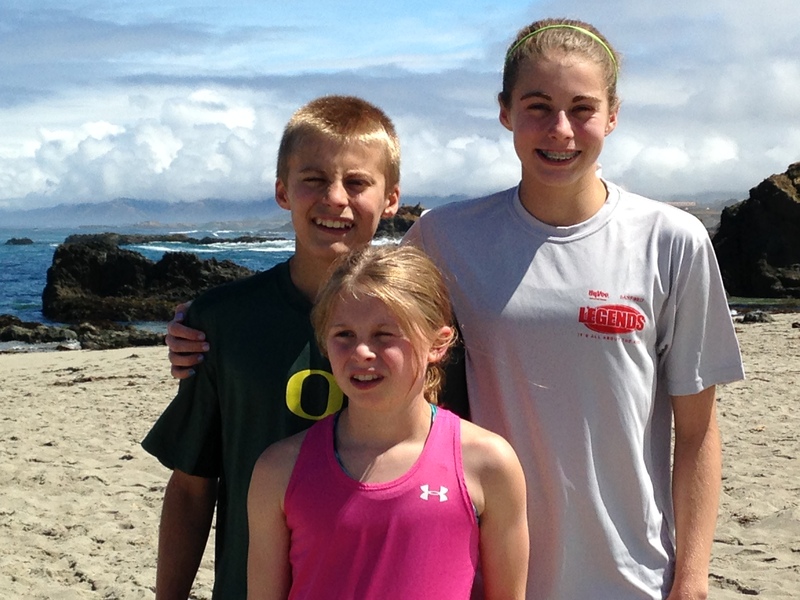 There are priorities, like training and triathlons, but as the kids are quickly realizing, there are many places they want to come back and spend more time. At least the weather was cooperating today and it was nice to see the sun after the last two days of rain. We decided to unload our bikes and tour part of the city on wheels. First, San Francisco is a very bike friendly town and whether you are on a path, trail or road, there are bikes everywhere. Unlike the Wilsons, you do not need to bring them on your travels as you can rent them for several hours through a variety of vendors. Second, having our bikes with us, we were less worried that something would happen to them while we were seeing the sights. 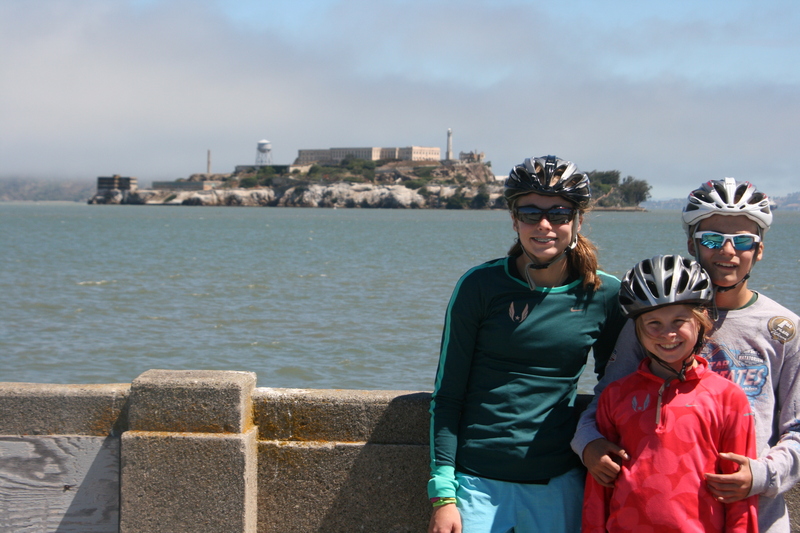 So after a most unexpected and beautiful ride through the San Francisco Maritime National Historic Park through a park to see Alcatraz, we watched numerous athletes swim with sea lions near the Hyde Street Pier. The water was COLD and most of the swimmers did not even have wetsuits. One of the swimmers that I stopped said it was cold but after a minute and half your body is numb anyway, so you just swim and get use to it. Awesome, sounds like fun….not! We decided to get an early lunch and found a sushi bar with a lunch special that allowed us to fill the kids without breaking the bank. With the triathlon, less than 24 hours, this was an important meal so we needed to fill them up. After lunch we continued to walk Jefferson Street for an afternoon of people watching at its best. 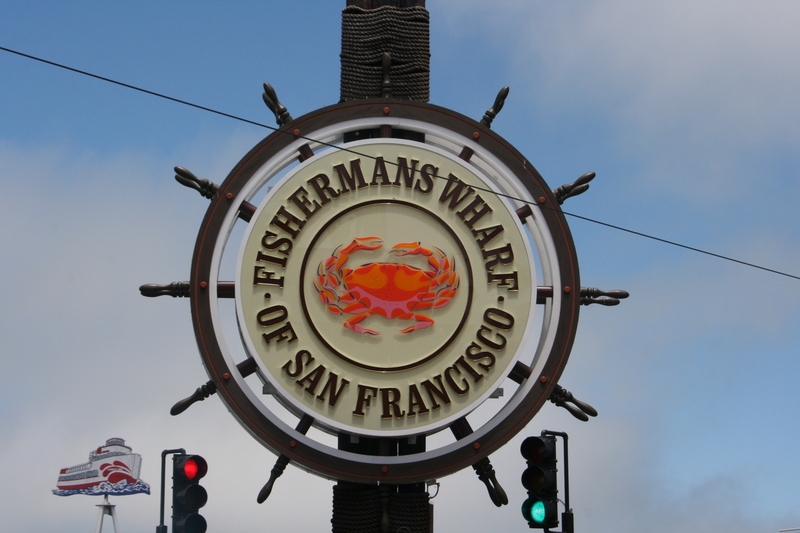 We all saw the famous Pier 39 sea lions or should we saw lion. Apparently in the summer, they swim south to breed and start returning in August with a few, call the pier their home all year long. Actually, there were two sunning themselves but a lot less than the 1700+ that have been counted in years past. I think perhaps we were fortunate, as I am not sure I would have been able to get rid of that smell from my mind! 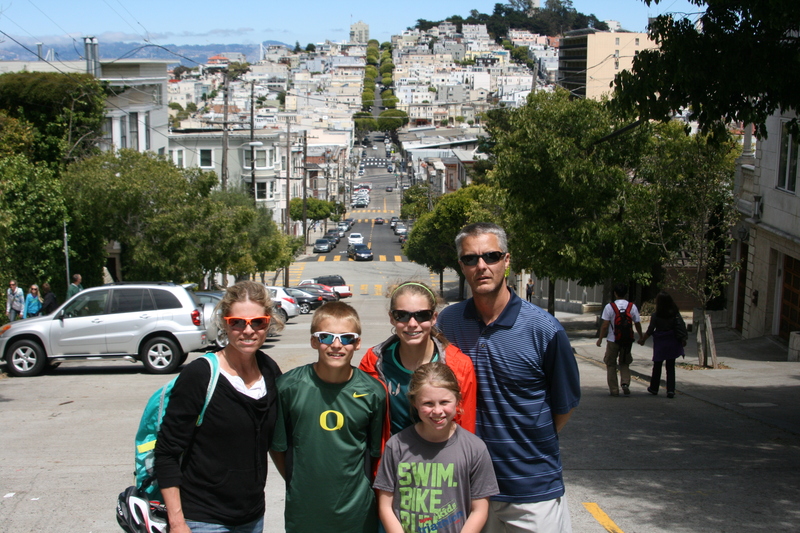 We then walked or should I say hiked our way up and down to Lombard Street. We actually had eaten right near the famous street, but the climb up Hyde to get to the curvy street with hydrangea covered switchbacks was straight up hill. Upon our descent, the kids still wanted to swim in the ocean with their wetsuits. Actually, Zach really wanted to as Kenzi was not sure even the suit would keep her warm enough from the frigid temps. Not to be outdone, they both took the plunge. I was so proud of them for their courageous to swim with those other nutty people. Definitely not my idea of fun as I detest being cold and had worn jeans and a light long sleeve top most of the day. I realize your body temp warms up when you work out, but you lost me when “your body goes completely numb in less than two minute thing. Yeah….no.” You need to understand that the temperature in San Fran, albeit sunny, was a low to mid 60’s. One minute the sun warmed you and the next a cold wind penetrated your frame and you would not know by the attire of both locals and tourists what temperature it might be. 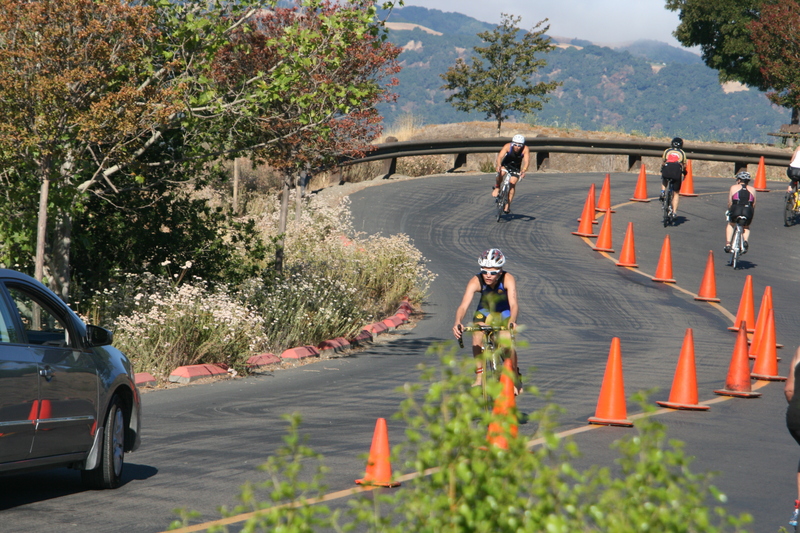 We finished the day stopping by a bike shop and then heading out of town to Hayward, Ca about an hour outside the city with traffic and thirty minutes from Pleasanton where the triathlon was being held in the morning. I finally got to do five loads of much needed laundry as Viv swam in the outdoor pool and Scott took the oldest to packet pick up. After a quick dinner of Italian carry out, we called it a night. We will see what tomorrow brings. After sleeping again in the car (do not recommend) everyone was tired, SMELLY and ready to get out and start the day. We found a local rec center called the C.V. Starr Aquatic Center, a very nice 8 lane pool and home to two different swim clubs-Mendocino Coast Sea Dragons and the Fort Bragg Aquatics Swim Team, neither which we swam with in the morning. Zach was finally able to get his 6000+ meters in with Kenzi shortly behind. I finished the workout with close to 2500 meters and Viv around 1100. It always feels so great to swim in the morning despite how and where we slept the night before. 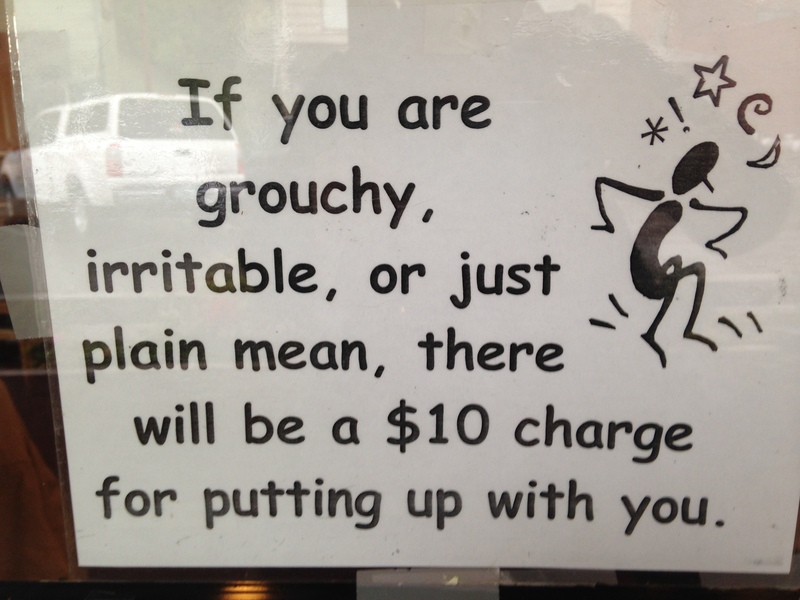 It typically gets most to all of the grumpies out and this time was no different. After the BEST shower ever, not really, but it felt great to get the stink off, we ate at another cute little diner called Eggheads. The theme was anything and everything Wizard of Oz from the décor to the menu to even the faded yellow brick road that took you through the kitchen and out the back to a separate building for a restroom. The food was as delightful as the owner greeting guests at the tables. When we shared with her our adventure on HWY 1, she laughed and said didn’t anyone tell you not to take that road at night? Apparently, her brother took it several years back for Thanksgiving and sore near to return. To this date, he has not been back to see her. She informed us there were three ways to get in and out of Fort Bragg, and by far, we picked the most challenging. We figured that. 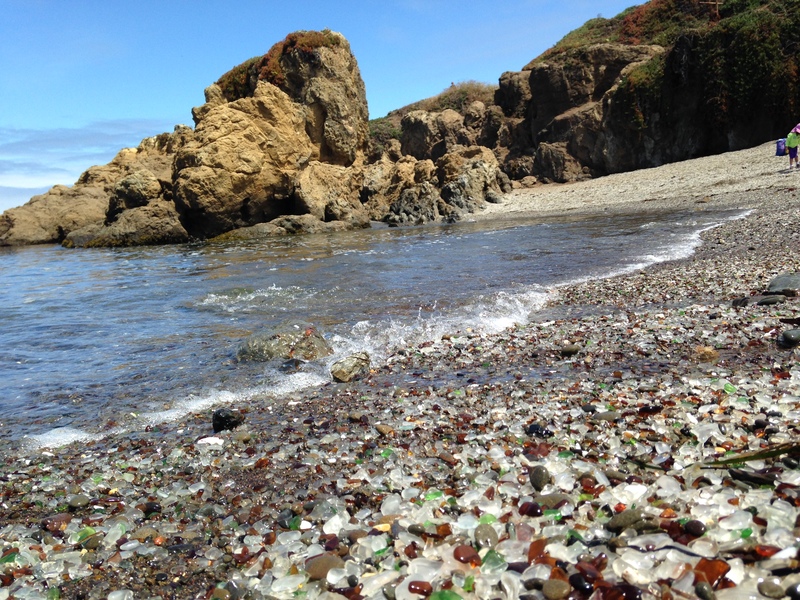 Glass Beach, one of the Ten Top Beaches to see in the World, was just a few blocks away. Our initial stop, once we made it to the beachfront area, lead us to a stretch with jagged boulders jutting out from the angry sea. Washed up on the beach was copious amounts of seaweed and grasses and tide pools for the kids to explore. 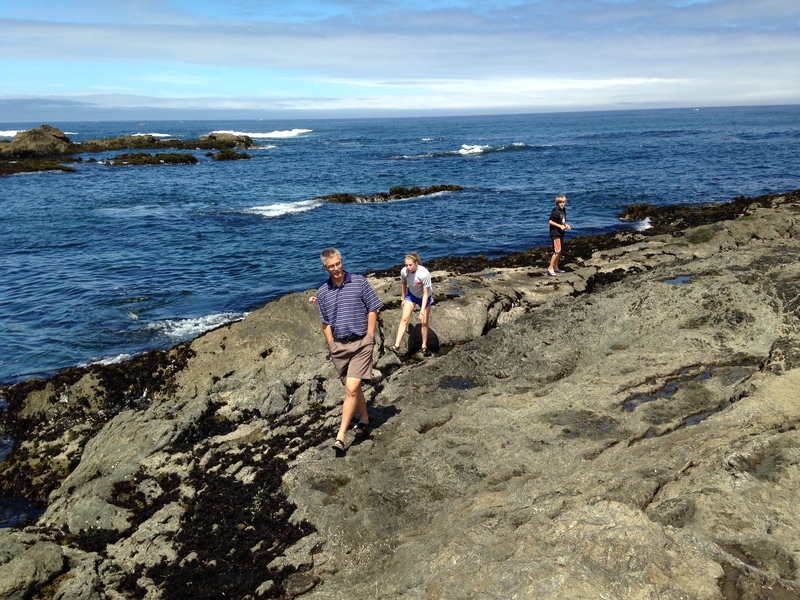 Not exactly what I was thinking, but the kids enjoyed exploring and crawling all over the rocky shore in search of sea urchin and crabs and oodles of other delightful treasures. I, on the other hand, was trying to make out pieces of the worn glass that beach was made famous for. I had decided we either were really in the wrong place or enough tourists had finally taken the last remnants of the famous shoreline. After talking with a few locals clamoring over the rocks, we realized we were not too far off our desired location. 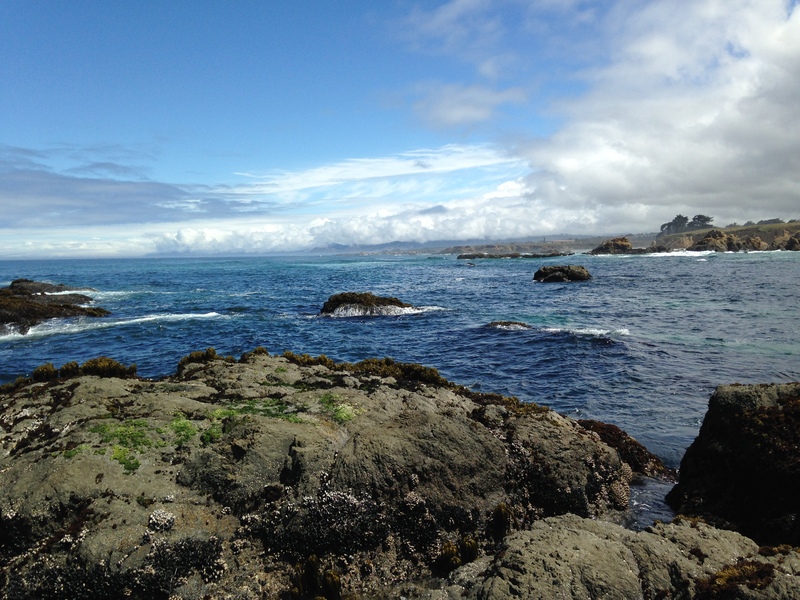 The Glass Beach we were searching for was just a hop, skip and climb a little farther south. As we made our way closer and closer, pieces of the old dump began to appear. Back in the 60’s when people started to become more environmentally aware, they cleaned up the large debris piles and closed the beach for dumping. What remains today are the smooth glass fragments from years and years of weathered broken glass. 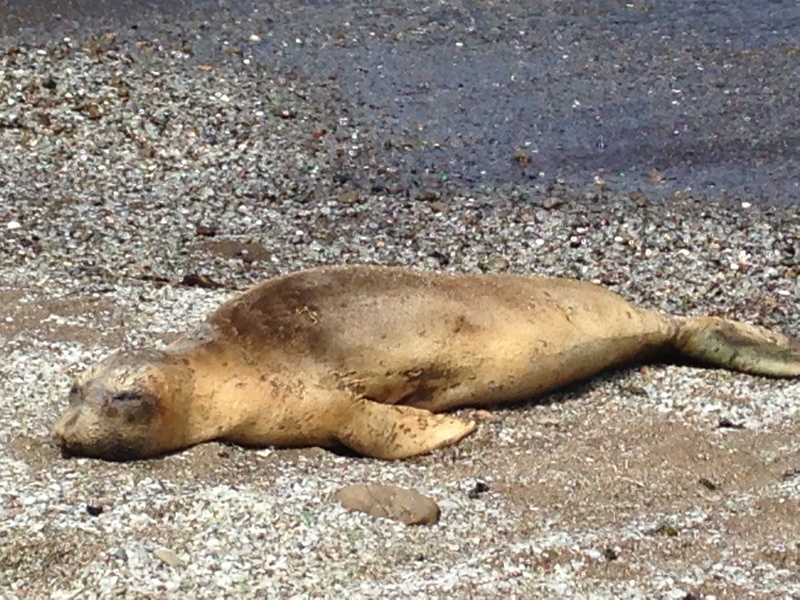 I am not sure what was more exciting though, finding the beach or the sea lion basking in the sun. After we got our fill of the unusual beach, we made our way inland towards Napa with the road being a slight bit better than nights past. I have determined I am not a big fan of California roads (at least the ones we took.) The roads might be pretty in Mercedez Benz commercials but that’s where I draw the line. The kids thought it was like a roller coaster and after a short time fell asleep. I am sure all that rocking and turning and curving put them right to bed whereas Scott and I where once again were white knuckling the curves as semis took corners at lightning speed. Okay, that was a little exaggerated, but must faster than either of us thought was safe. The road was a whole lot better than last night, but still in the light of day, not something we were going to get use to anytime soon. We made it to Sonoma County and passed numerous well know vineyards with large estates overlooking acres and acres of vineyards. 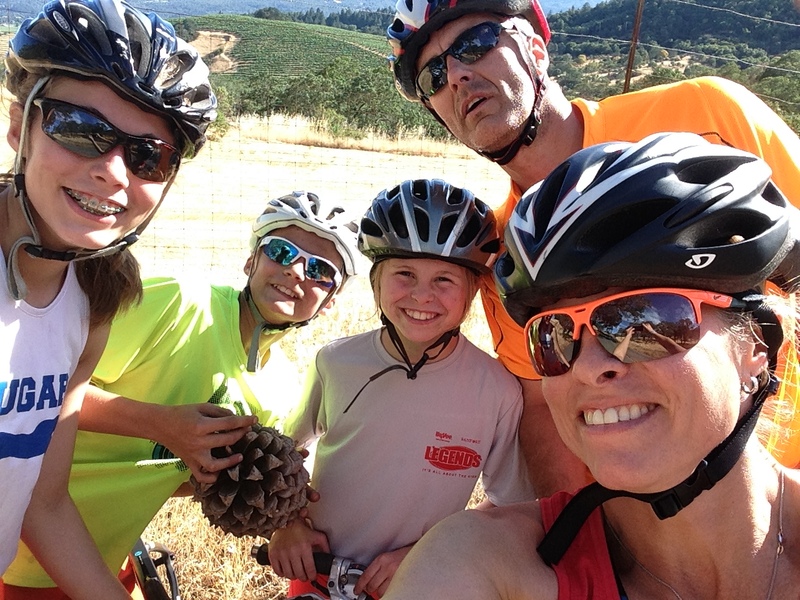 Our plans were to bike a short route through wine country as I had heard great things about this experience and had notions in my head of what this might look like. With our love of wine, I thought this would be a great way to celebrate Scott’s birthday. He found several routes that riders could take as we made our way into wine country and we decided on an “easy to moderate” twelve mile ride that he thought Viv could handle and I was really looking forward to this beautiful and leisurely ride through wine country. I met up with them around the bend and Viv was DONE. She might have given a best effort, but she threw in the towel when she saw me and was not biking uphill another second. Scott was going to go after the older two and I graciously offered to hang with her. As Scott left, he chimed “It said it was easy to moderate ride.” Oh well, Viv and I could spend a little time together and she and I laughed at how hard the ride was and how tired her legs were. I was so proud of her for all that she had accomplished. Really, I was astonished. The kids came back about 20 minutes later, Zach carrying an enormous conifer cone, with Scott following a few minutes behind. They had made it all the way to the lake and I was so jealous and proud of them and knew quite confidently that the only way I was going to see that lake was if we drove back to it. After a few family photos, we made our way back to the car and decided we had not had enough of wine country so if hotels.com showed anything that might work in our budget, we were going to stay in Napa. Lucky for us, the Meritage Spa and Resort, south of Napa had two queen beds for the taking. We checked in, showered and went into town for a late night dinner. 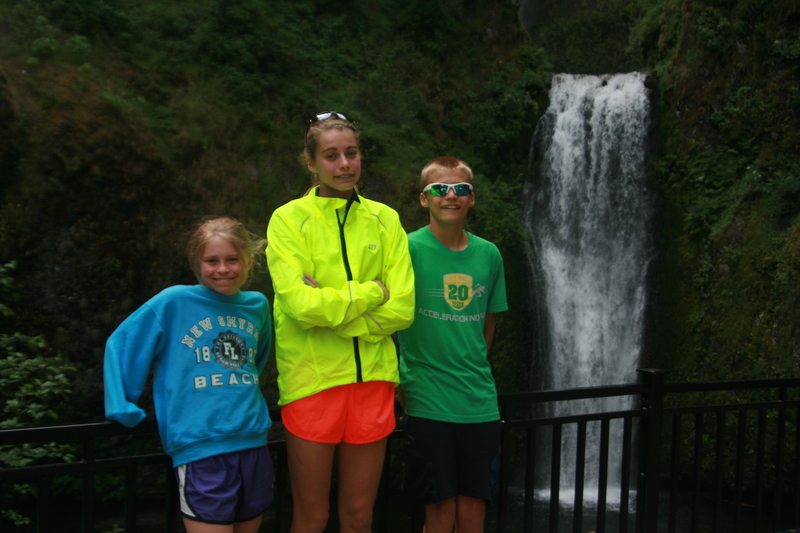 Even though the kids were on their best behavior, it was clear that we were out of place. We attempted to eat at one restaurant but with the slow service, we left to seek friendly staff who wanted our money and to feed us. There were numerous dining options from inexpensive to break the bank and since we were with hungry kids, and our first attempt was a bust, two of the three voted for BurgerFi, an all natural burger joint. Not exactly thought what I would be dining on in Napa. Kenzi and I had the quinoa burgers which were delicious. Scott and I agreed that we would have to come back and have an adult meal and some point in the future. Uggg. Well another day dashed. 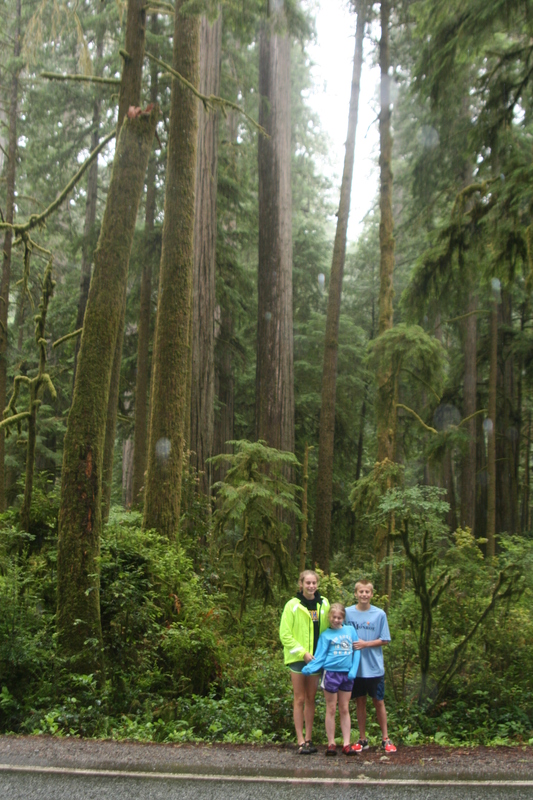 They were not kidding when they say the Pacific Northwest is wet….really wet….really, really wet! 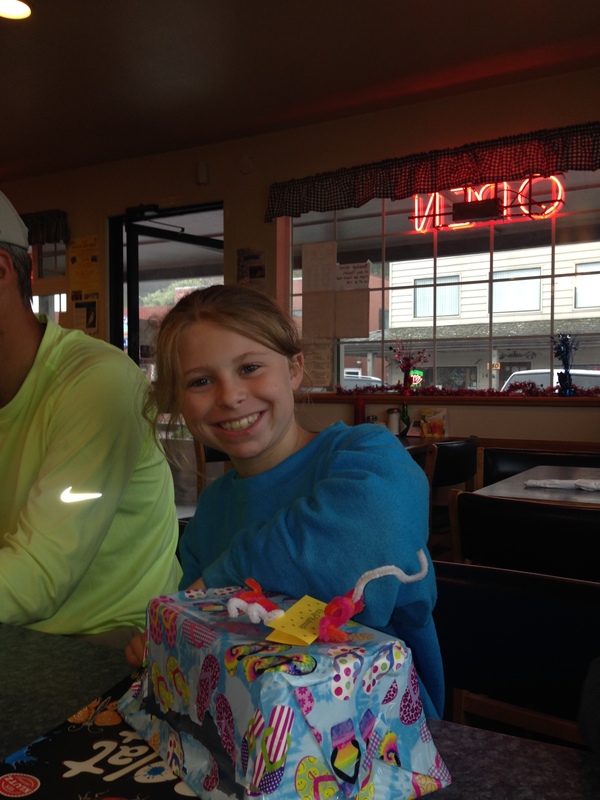 In the morning, we woke early and continued on toward Bandon to grab a big birthday breakfast. After sleeping in a Fred Meyer parking lot, we all deserved a delicious and filling breakfast and the Minute Café seem to offer what we were looking for. 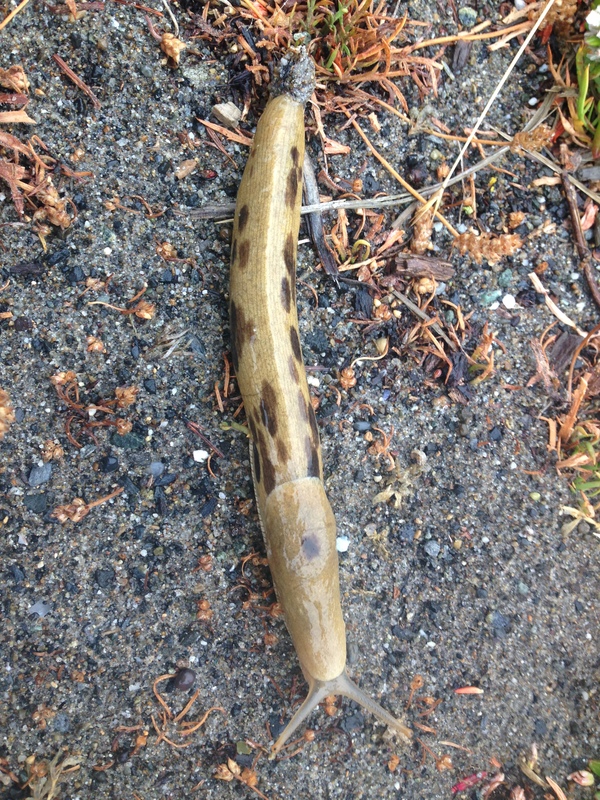 Despite the rain, we had a good time exploring the beach and though we did not see any sea lions, whale or puffin, we discovered the Pacific Northwest banana slug. In fact, lots of them as they did not seem to shy away from the weather. After what seemed like hours of driving along the coast enjoying the views of the ocean through the rain and fog, our road seemed transform into a mystical land of 150 feet tall trees. We heard shouts and screams coming from the back of sheer joy as we made our way deeper and deeper into the forest. We stopped several times to get our pictures taken with one of the massive celebrities each with their own personality and unique attributes. They too were spectacular. 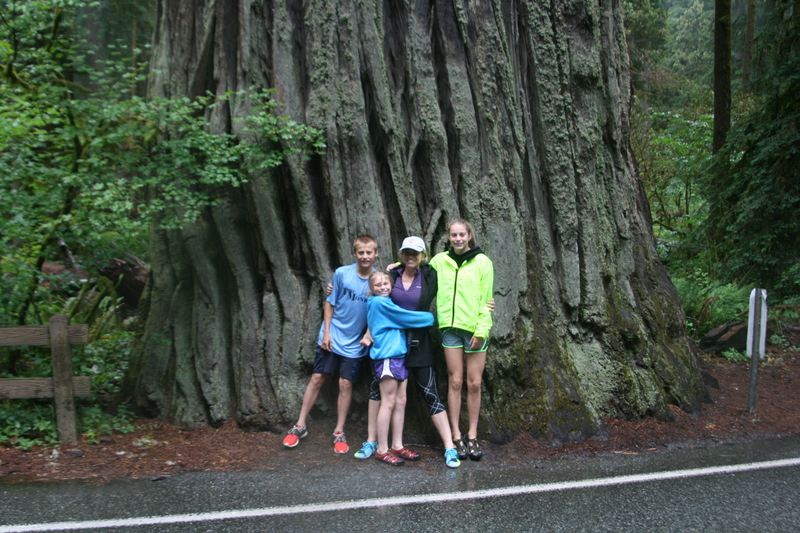 As we made our way through the forest, we stopped by the visitor’s center on the north edge of the Jedediah Smith Redwood State Park, one of the many state and national parks to see the famous Redwood Trees. The kids had not engaged in the National Parks Junior Ranger programs up to this point, but with the rain they were getting a little wild and we had them all do the activities to keep them engaged as we made our way through the park. 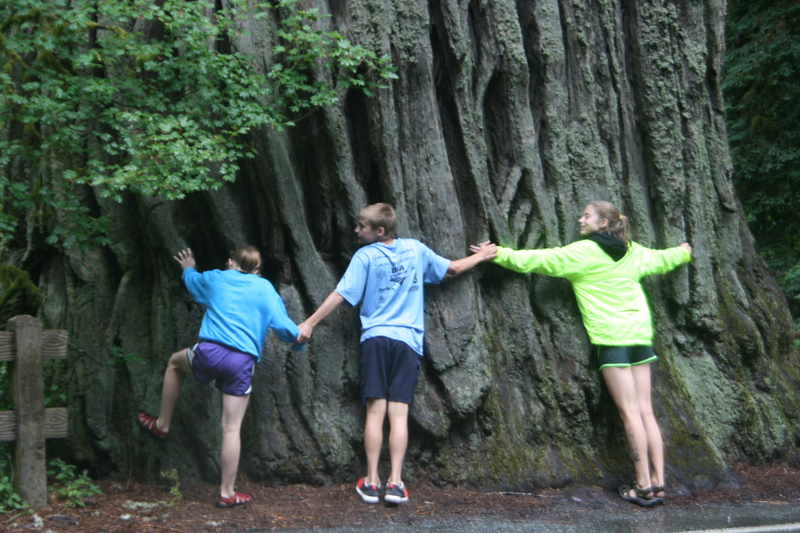 When we got to Redwood National Park Prairie Creek, they were officially sworn in as junior rangers. Of course, Zach thought this was a little juvenile as the activities were directed for a younger crowd but he appeased me and Vivian thought it was cool. The real gem was behind the gift shop and visitor’s center, as there stood a secret forest filled with the most unusual trees where the kids could climb on around and in. They were absolutely massive and look like something out of the Ewok village in Star Wars. We continued on and stopped for an early dinner at a little bar/restaurant called Lost Coast Brewery and Café to again celebrate Viv’s birthday. It received high marks on the travel site and we needed to get out and stretch our legs, not realizing at the time just how important this would be. Hoping to make it to Fort Bragg in the late evening, we set off for the 133 mile route. What concerned Scott was why the route said it would take 3 hours and 15 minutes? Even the waitress said it would take a little over 3 hours. Oh well, we would go as far as we could and then stop if need be. 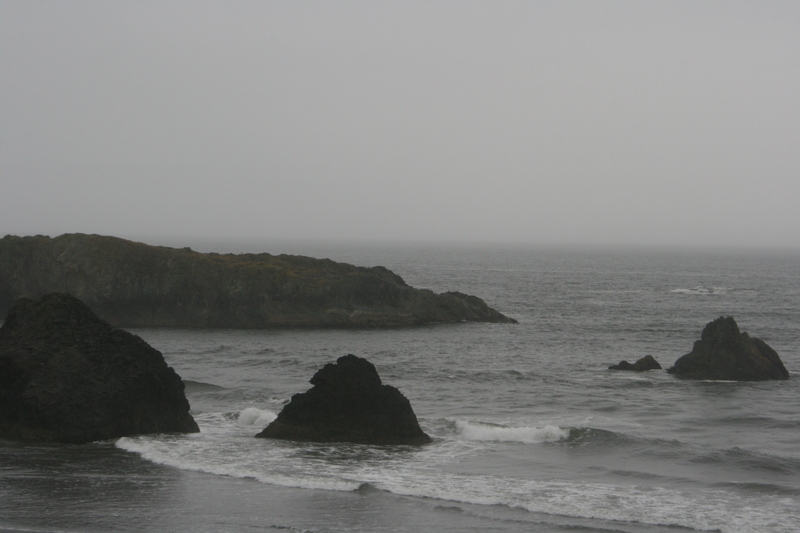 Everything was going fine until we got to Leggett and got off 101 and took HWY 1 down the coast to Fort Bragg. It was still dusk as we went from a four lane divided road, to a two lane, no shoulder lane. 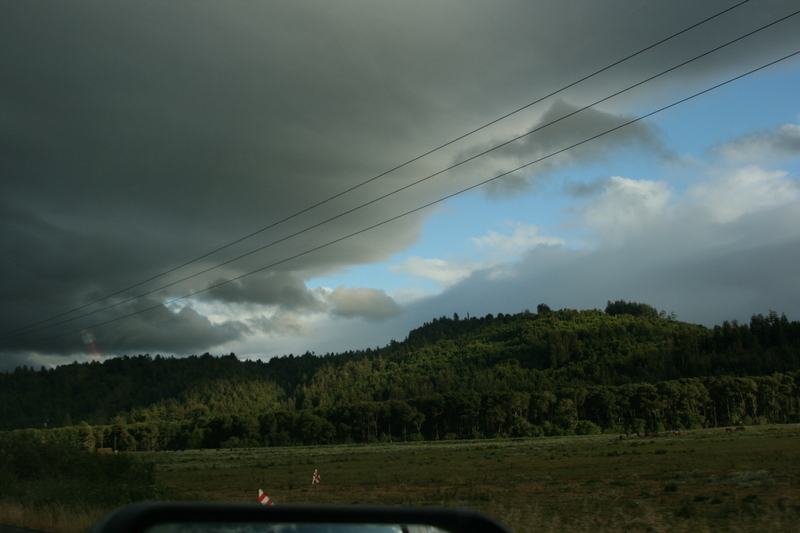 It was a pretty drive as the sun was bouncing off the hills with dark rain clouds to either side. We even caught a glimpse of a faint rainbow as we wound our way through the bend and twisted and turned through the woods of several state parks. Okay this made sense as we had to slow down to 40-45mph through the tree lined highway. 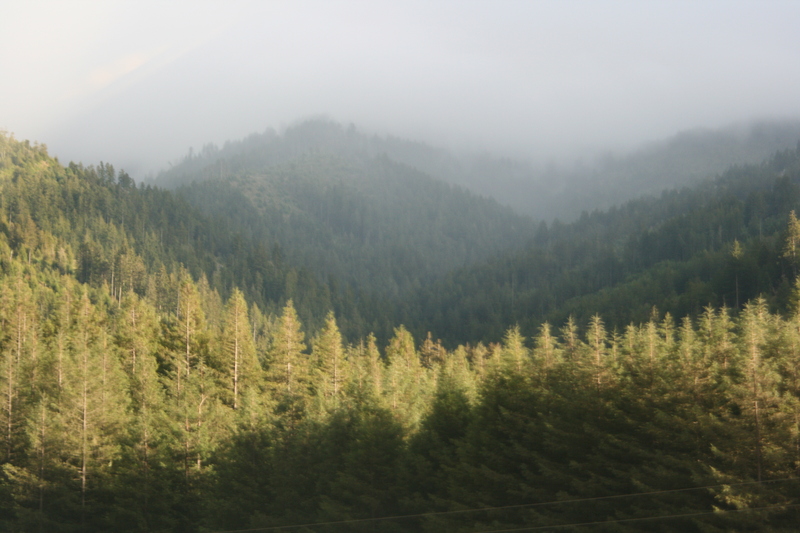 The sun was now almost set and the tall 200ft trees blocked any sign of any remaining daylight. The only light was the reflection of the meticulously placed bright yellow reflectors ever three feet. All of a sudden our straight two lane highway went all small intestine on us and even Mapquest and Waze were a tad inaccurate in their description. In fact, I was convinced that the satellite rendering were so confused, it was just made up roadmap lines to make us feel better. Almost instantaneously as the sun went completely down, the road went completely up and then did a nice 30 degree turn. “Oh this is going to be great!” I had enough problems with the cliffs at Yellowstone. Before I could even get that out we made another turn in the opposite direction almost 90 degrees, still at a nice healthy grade. Without taking you through the entire 55 minute nail biting, crap in your pants ride (sorry for the vulgar description) but truly there are no other words, I will consolidate. There were about 10-15 switchbacks both up and down the mountain. For those who do not know that term, it is when the road or trail completely switches back the opposite direction. That meant that I was either face planting with a rocky, jagged tree lined side of a mountain or the cliff of the ocean. Of course, there were no rails going up. Why would there be? Just an occasional sign that stated, “Hazardous road ahead.” Hmmpf, just parts were hazardous? Interesting people these Californians and their ideas of safety. The only thing worse would be fog and then just as Scott said, “The only thing worse would be fog,” a thick cloud of fog appeared. “You’re you kidding me?” We both broke out into laughter but I really think it was more to break the nervousness that we both felt. Obviously, we missed the notes on do not travel at night. About half way up the mountain, our headlights beamed on some kind of animal sticking out of the dirt mound who I truly think was out there for entertainment sake as he heard our trailer pull around the winding road. We could almost read his thoughts “What idiot is travelling this road tonight?” I thought I was on a rollercoaster from hell. Even Scott, who normally is a one handed driver had both hands clutched to the wheel, steering with the utmost of care. When we finally made it out of the dense forest and alongside the cliff’s edge, we both were exhausted. I insisted that Scott pull over if only for 15 minutes. It was pitch black out and nothing seemed safe. 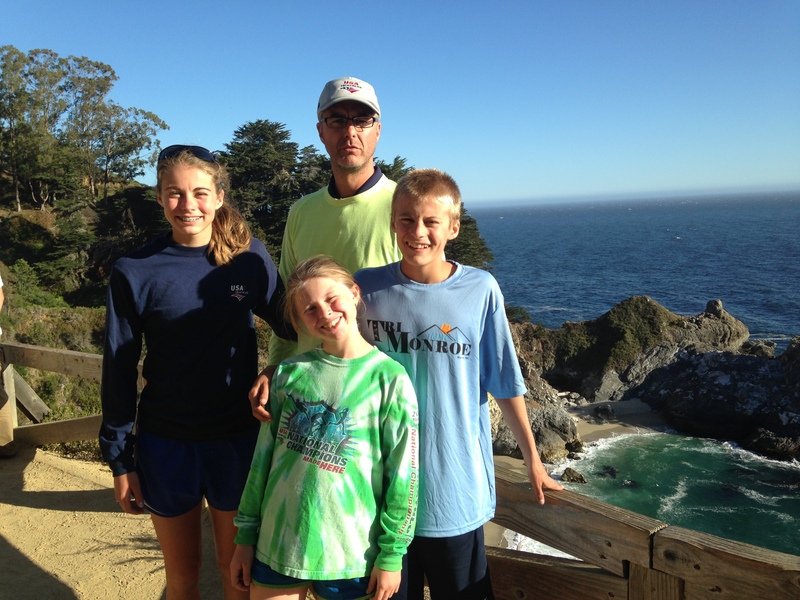 With the kids still sound asleep and Fort Bragg was less than 25 miles away, Scott decided to finish the drive and then we collapsed in yet another parking lot too exhausted to unload ourselves or the kids. We had made it, barely, and we would figure things out in the morning. To give anything less than your best, is to sacrifice the gift. Today started like most “normal” days on this trip but certainly did not end that way. A typical day includes an early first breakfast at the local hotel, a swim at the YMCA, a second breakfast back at the hotel, a quick pack up and then out the door to the next destination or adventure. This morning however, we added a couple of loads at the local Laundromat, as the machine at the hotel was broken. I am actually learning to roll with it quite well other than the stink of running and biking clothes. I was hoping for a swim to help with the recovery process of all the hiking and biking from yesterday but I was able to accomplish the more important task of fresh clean clothes. 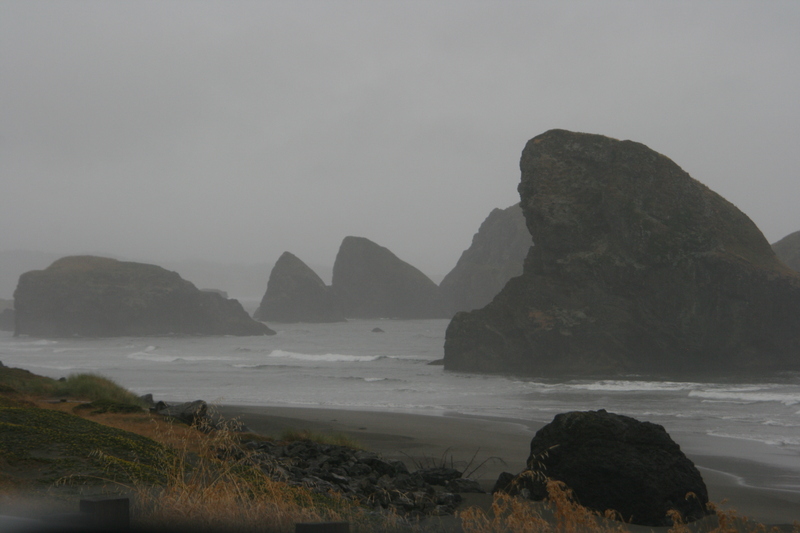 I also struck up a wonderful conversation with a fellow traveler from Texas who was making her way up from San Francisco via the coast to Oregon and then back down via the mainland. We compared notes and travel adventures and it made the monotony of laundry quite enjoyable. Once packed, we now headed towards yet our third breakfast or daytime snack, however you want to look at it. Heading back downtown to Portland to the infamous Voodoo donuts where donuts and art collide 24-7-365, we stood in line out the door for the sugary sweets Most of the donuts were G rated and were sprinkled and filled with every color and goop imaginable including Fruit Loops, Tang, peanut butter, Butterfinger and Cocoa Puffs. 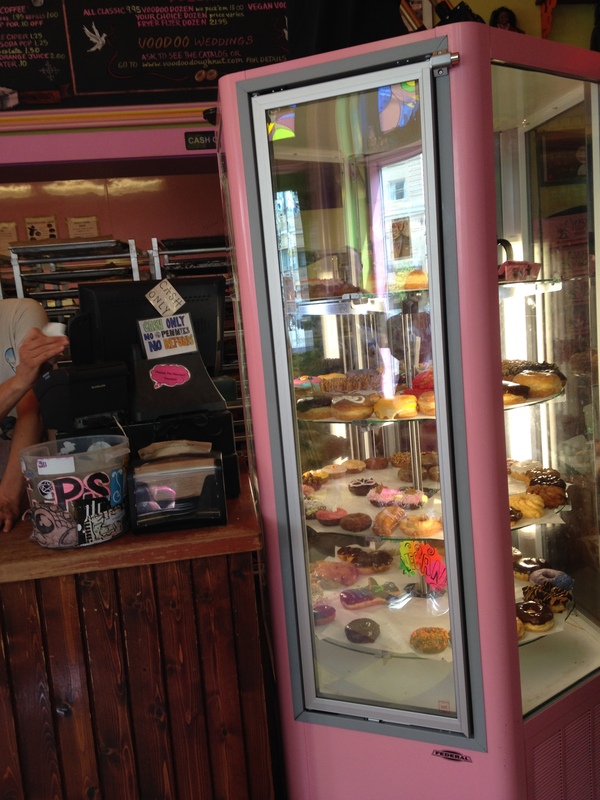 It was a sugar glutton’s paradise. Vivian thought she had struck gold and could not decide which gloppy mess she wanted to indulge in. 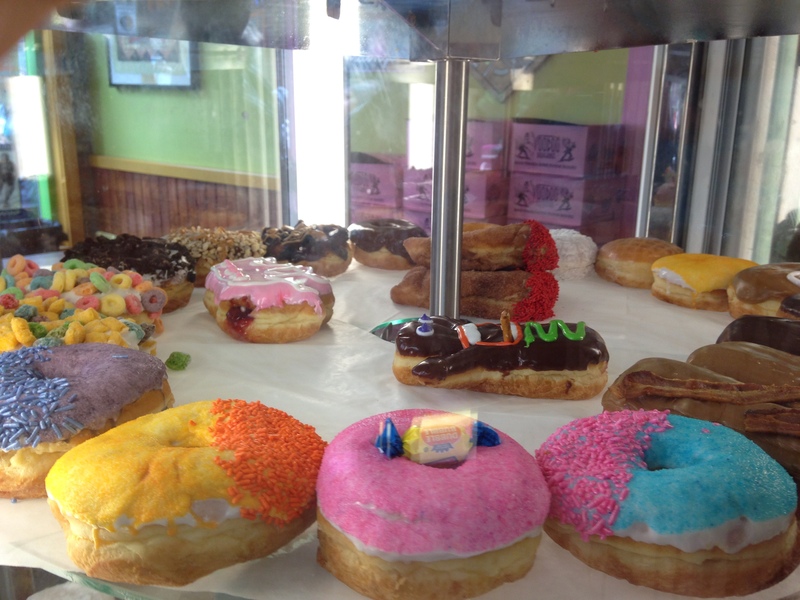 But for an athlete in training or those that prefer a little less processed color their plain yeast and cake donuts were equally spectacular. 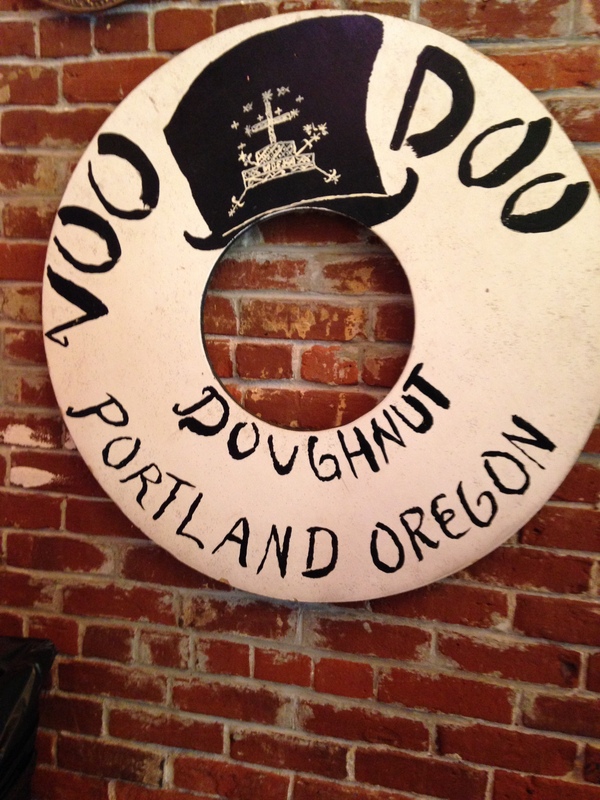 Just so we could say we had the experience, we ordered a box of Voodoo-a dozen donuts that they select and place in a very large oversized bright pink box as to not squish the miniature masterpieces. 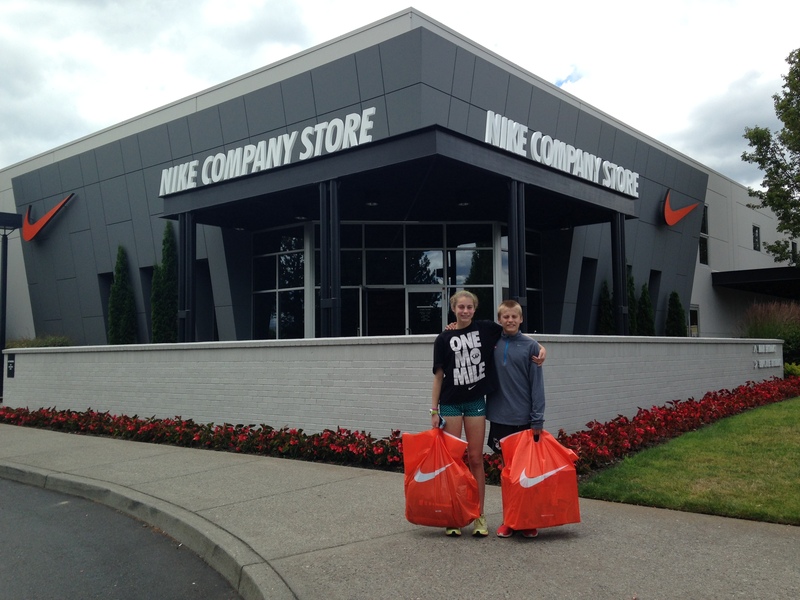 Then we headed to of course Nike Headquarters in Beaverton. Isn’t that what every family who stuffs their faces with donuts do? Anyway, my dear friend Pilar, through her connections with Nike, secured us passes to go to the Nike Employee Store for the day. So to explain for those unfamiliar, this is nirvana for anyone who wears Nike clothing, shoes or paraphernalia. These are the one offs, latest and greatest Nike products all 50% off. Needless to say, we spent a few hours and a couple of dollars (thank you grandma and grandpa for some spending money) at the store, but definitely limited the purchases as funds are limited and we still have more to see and do. A HUGE thank you to Pilar for setting this experience up. 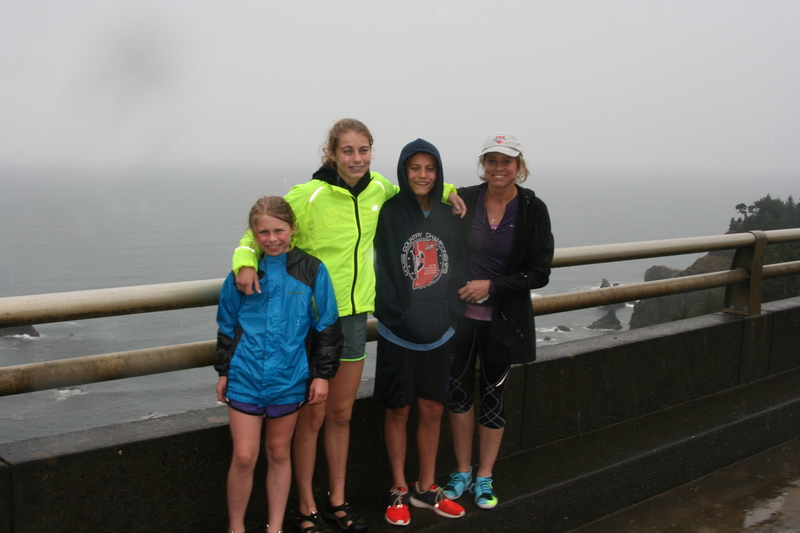 We would have loved to do the tour the following day, but we have a triathlon on Saturday in Pleasanton, CA and need to continue making our way south along the Oregon and California coasts. 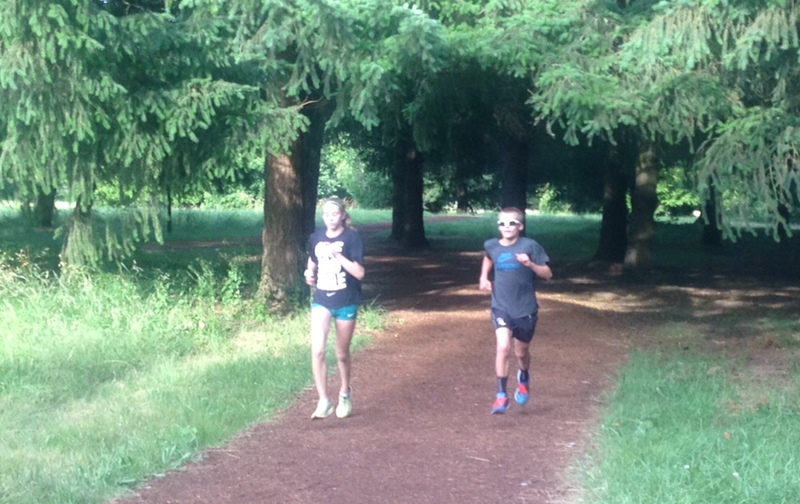 However, before we left Beaverton and the Nike Headquarters, we were determined to run the two mile woodchip trail around the headquarters as well as infiltrate the track in the woods. There was so much misinformation around whether we could or could not, but we decided to “Just Do It.” Dressed in Nike gear, we pulled in and parked near the large marketing vehicles and construction workers as we had our trailer in tow and did not want to look to conspicuous. I thought we blended in nicely and the guards patrolling the facilities did not ask any questions. Scott dropped us off and we just got out and started running. It was the middle of the day and there were not a lot of people on the infamous trail. We thought perhaps we might have seen a professional athlete or two on the campus by their stature. Yes, we were totally profiling, but if I had placed bets, one was a professional boxer and another was a distance track runner. 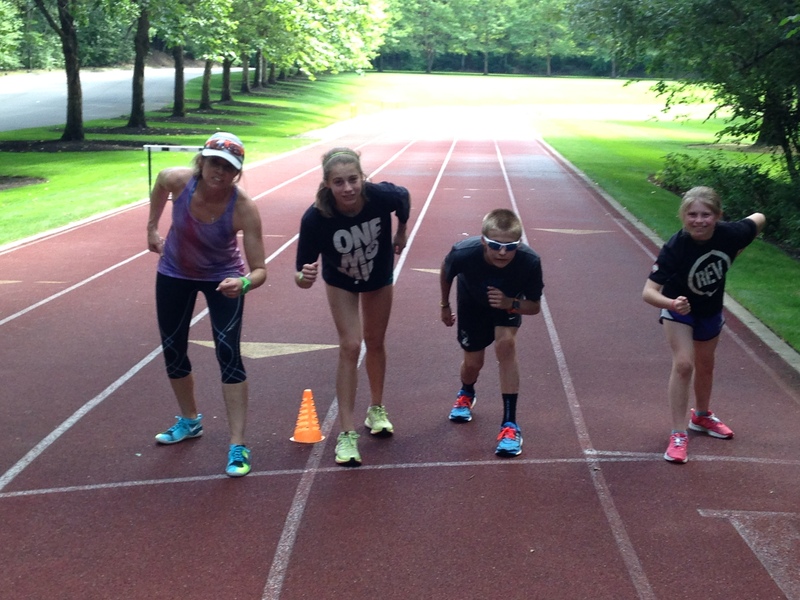 After a loop around the track (or two), the kids and I did 100 meter dash. Oh, to be young again. 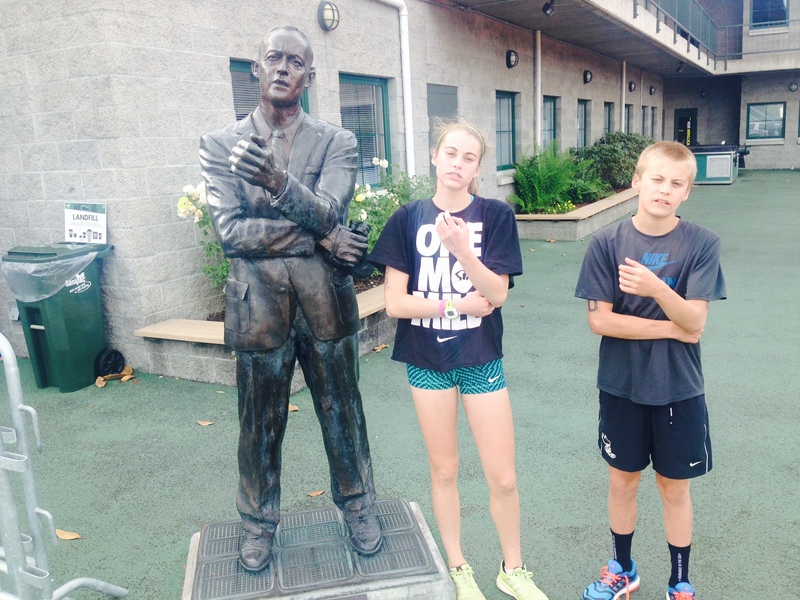 Next stop Eugene, OR, the stopping grounds of the late Steve Prefontaine and home to the Oregon Ducks, and Hayward Field. This is the birthplace of legends and if running is your thing, this is the place to be and we were there. Can we call this a college visit? 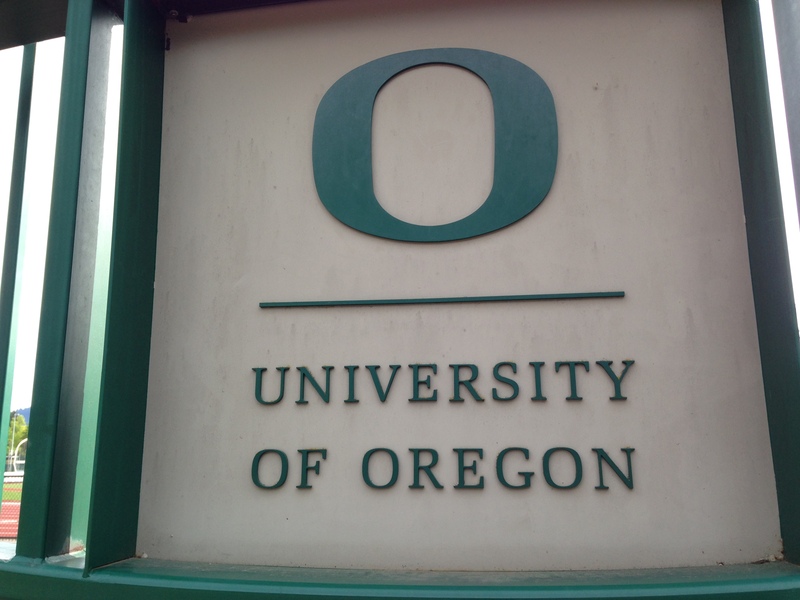 This is one of the schools on Zach’s short list, though he still has a few years to decide. As will most of this trip thus far, luck and good fortune have paved the way and we arrived just a few minutes before the facilities Director of Hayward Field would shut it down for the evening. He allowed the kids to run a lap around the famous track where just last week the NCAA T&F National Championships were held. In July, the historic field will host USATF Championships and 212 countries at the IAAF World Junior Championships. We toured around the town and found the memorial for Pre as well as the Alton Baker Park where the kids again ran “Pre’s Trail.” Though this day did not top swimming in the pool with Michael Phelps and celebrating his birthday with his dog Herman, several years back in Baltimore, it definitely was up there on the memories of things accomplished. 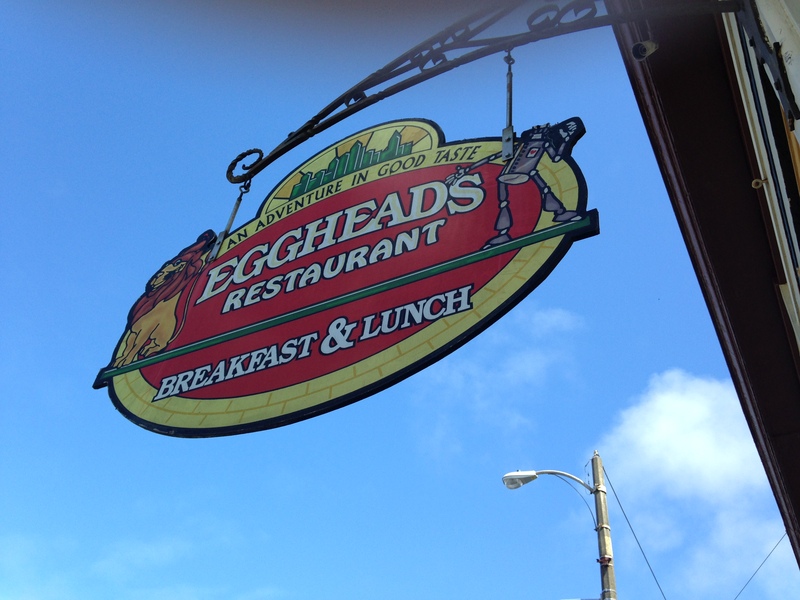 No one was immediately hungry after the run, so onward to Coos Bay where Pre grew up. 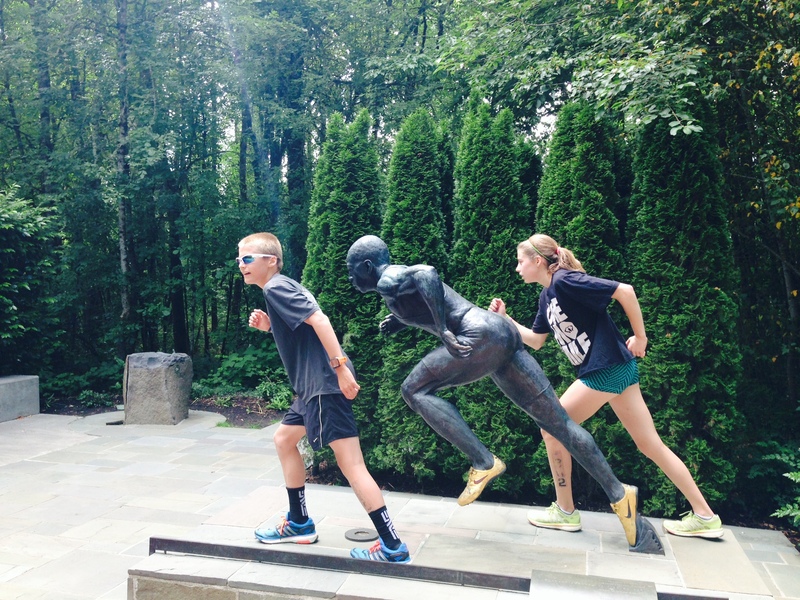 We had not necessarily made this a Steve Prefontaine pilgrimage, but it worked out that way which could not made the kids more thrilled. This was accomplished in a little under two hours, witnessing many elk and driving along the Umqua River a good portion of the way, yet another spectacular drive. We arrived in Coos Bay and you would have thought we hit a ghost town, other than the fact that every hotel, motel and RV park read “Full, No Vacancy, Sorry.” Wow, happening place this Coos Bay and with our obsession with Eugene, we neglected to secure our hotel through hotels.com in a timely manner. With limited options, we ordered pizza and pulled into a parking lot and called it a night. I really wish it was that simple as it does take a little rearranging to get the three amigos situated. The good news was that every place since about Butte, the store fronts, gas stations and shops read Espresso, not fresh coffee like the Midwest, so the morning looked promising. We woke up early and created a game plan for the day. 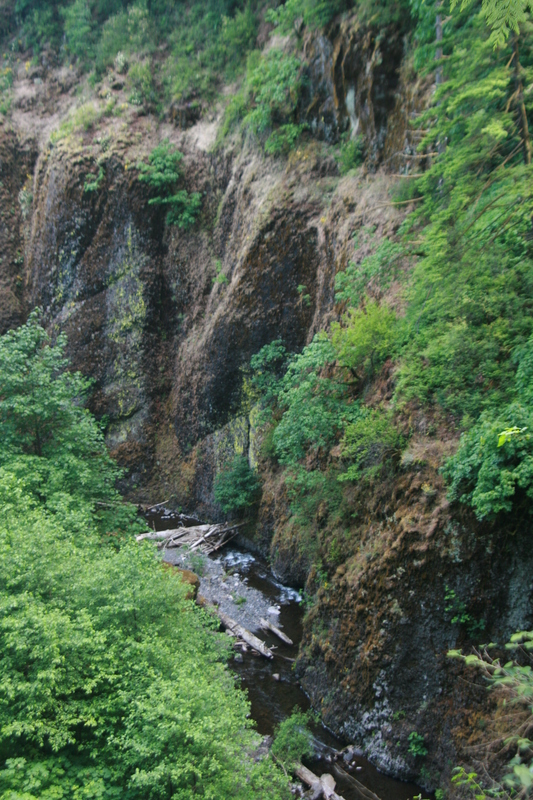 We headed toward Multnomah Falls, one of the many outstanding recommendations of www.roadtrippers.com, a website we used to craft numerous stops along our travels. We highly recommend to all those reading this or plan to travel, as it has been an enormously helpful tool. Of course, we have not followed our itinerary exactly, as we have spent more time in certain places and scratched other destinations altogether. 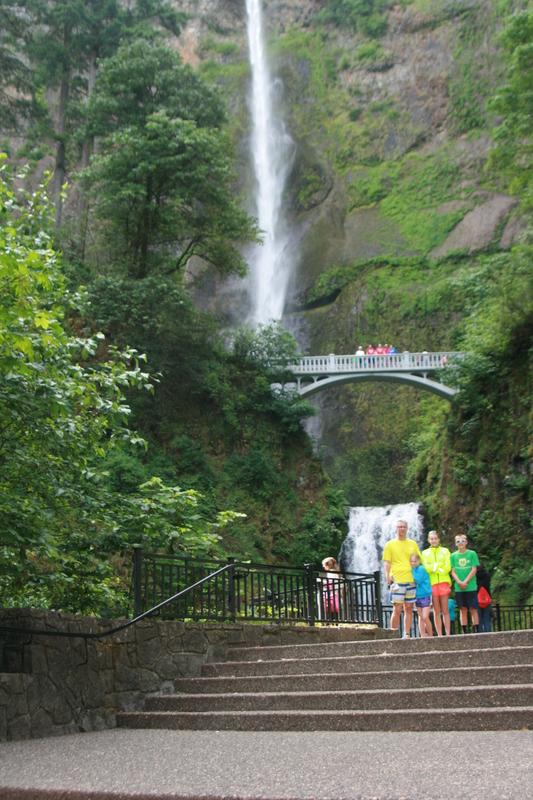 Multnomah Falls did not disappoint. It was the falls that initially brought us to this stop, but it was the winding trail to the top that provided more beauty than expected. The intense 1.5 mile hike stretching over 1000 ft. elevation was spectacular as Scott and I paced ourselves up the steep cliff unlike Kenzi, Zach and Viv who at times appeared to be bouncing, jogging and running up the lean moss covered and fern filled path overlooking the Columbia River. After the descent, Scott, Kenzi and Zach decided to get a “workout” ride in on the single lane, hilly, no shoulder road from Multnomah to a parking lot just seven miles east where Viv and I would join them for a less precarious route along the river. With a healthy ride in the sun and temps much warmer than that of the Tetons and Glacier, we cut the ride just short of our plans but still managed to secure another eight miles down and back. Loading up the bikes and scrounging for water resources, we then headed towards Bonneville Dam, visitor center and fish hatchery located off the fast moving waters of the Columbia. It was incredible to witness the energy around the power plant and facilities run by the US Corp of Engineers. It was very impressive. We also managed to watch numerous Shad and a few Sockeye Salmon, hurl themselves up and over the ladder and swim through the elevated gate system, as they made their way upstream to spawn. In fact, 78,000 Shad, were counted going through the system the day before! We also saw a most interesting parasitic and primitive animal, called a Pacific Lamprey, which was an eel like creature, native to the Pacific Northwest. We were fortunate to observe hundreds of these sharp teethed ugly creatures, suctioned to the glass through the fast moving water. Think Medusa’s hair- snake like, no scales, slimy creatures making their way to spawn. After we got our fill with gross but interesting, we headed to the fragrant and peaceful lavender gardens which impeccably groomed and housed white sturgeon and numerous trout pools. 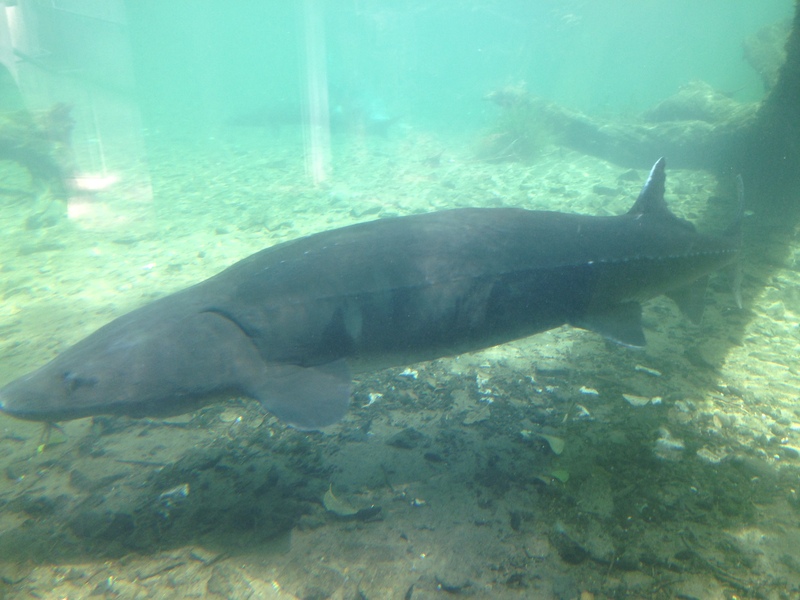 We celebrated the 70th birthday of a 10ft sturgeon affectionately named “Herman.” Herman shared a pool with three other large sturgeon close to his size and a few massive rainbow trout. The fauna and flora that surround the grounds made you feel you had stepped into wonderland and the stroll along the quaint hatchery was a welcome relief from the heat and exercise earlier in the day. Shifting gears, we had plans to visit a friend for dinner but wanted to finish the day of training with a swim. Arriving to the Y a little later than planned, we descended upon a local swim team for their afternoon practice. Unfortunately, most of their elite swimmers were away at a meet, so the kids had a modified practice with the team. It was a nice facilities and equally friendly staff. We have been very pleased with our experiences at the various YMCA’s across the country and it had allowed the kids to swim in a variety of different environments. Finally, we ended the day with a drive into the city to see an old high school friend who graciously hosted us to a delicious meal of grilled tenderloin and fresh veggies. 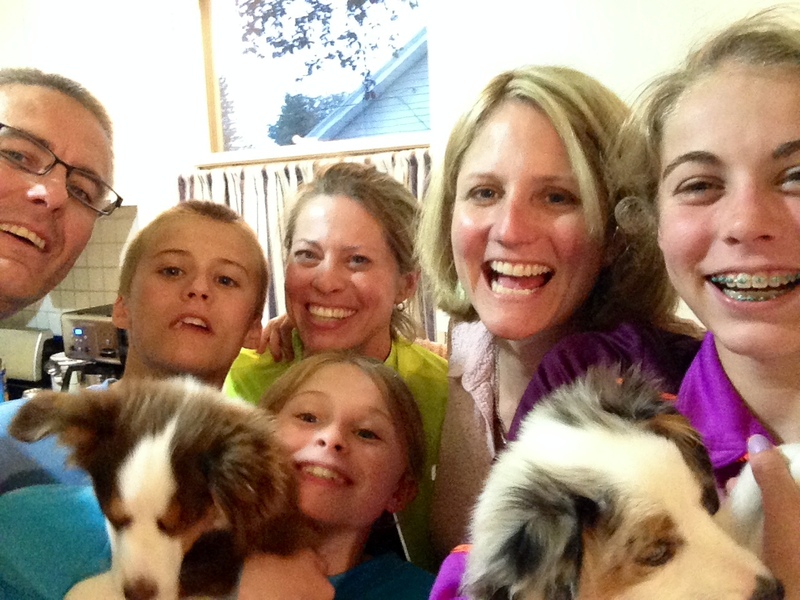 Her two miniature Australian shepherd pups, Riley and Levi, kept the kids thoroughly entertained and help to satiate any longings of our beloved four legged friends. It was a wonderful couple of hours and we were thrilled to have a home cooked meal and reconnect with a friend and her world. Thank you Pilar for opening up your home and allowing us some time with you.